This is a timeline of the War in Donbass, from 1 July 2018. The timeline follows an ongoing conflict between Ukraine and anti-government pro-Russian separatists supported by Russia in the Donbass region in eastern Ukraine. The press-centre of the Joint Forces Operation (JFO) reported in the morning that pro-Russian forces had opened fire on 26 occasions on Ukrainian positions on the last day of June (including on 20 occasions in Donetsk region and on 6 occasions in Luhansk region); the fire was returned on 9 occasions. By the morning of 1 July two ceasefire violations were registered with no casualties on the Ukrainian side; the fire was not returned. The spokesman of the Ministry of Defence confirmed at noon that one Ukrainian serviceman was wounded in the Donbass region on the last day of June. Pro-Russian sources from the self-proclaimed Donetsk People's Republic reported four Ukrainian violations of the new ceasefire in four different locations using small arms, automatic grenade launchers, 73 antitank recoilless rifles, 82 mm mortars, armoured personnel carriers and armoured fighting vehicles. According to local authorities, Ukrainian forces broke the ceasefire two times inside the territory of the self-proclaimed Luhansk People's Republic. The Ukrainian military attacked pro-Russian troops at Donetskyi and Lozove with small arms, automatic grenade launchers, antitank rocket launchers, 120 mm mortars and BMP-1 armoured vehicles. According to the information provided by the press-centre of the JFO headquarters in the evening pro-Russian forces had opened fire on positions of Ukrainian troops on 7 occasions between 7:00 am and 6:00 pm, no casualties were reported. By the end of the day a total of 25 ceasefire violations were registered with no casualties on the Ukrainian side. In the region of Mariupol, Vodiane, Hnutove and Shyrokyne became the target of small arms, heavy machine guns, automatic grenade launchers and antitank rocket launchers. In the northern section of the demarcation line, Zaitseve and Troitske came under 82 mm and 120 mm mortar fire. Several civilian buildings were damaged at Zaitseve. Pro-Russian armoured fighting vehicles from Holmivsky engaged Ukrainian forces at Hladosove. The separatists attacked Ukrainian positions at Shchastya, Luhanske, Krymske, Svitlodarsk and Novooleksandrivka with small arms, heavy machine guns and rocket launchers. Pro-Russian authorities at Donetsk city told the press that the Ukrainian military broke the ceasefire on a number of occasions throughout the day. In the main incidents, two antitank missiles fired from Slavne destroyed a Kamaz water supply truck at Signalne, in the region of Mariupol. The driver died of his wounds. In the surroundings of Donetsk city, BMP-2 armoured fighting vehicles engaged pro-Russian positions at Dokuchaievsk. Two civilian residences were heavily damaged. Officials from the self-proclaimed Luhansk People's Republic reported two Ukrainian violations of the truce by evening. BMP-1 armoured vehicles attacked pro-Russian positions at Slovianoserbsk supported by small arms and 82 mm mortar fire, while Kalynivka became the target of heavy machine guns and grenade launchers. The press-centre of the Ministry of Defence reported the following casualties during the past week (the 26th week of 2018, from Monday the 25th of June to Sunday the 1st of July): eight Ukrainian soldiers were killed in action and twelve were wounded. According to the information provided by the press-centre of the JFO headquarters in the morning pro-Russian forces had opened fire on 25 occasions on Ukrainian positions the previous day (including on 9 occasions in Donetsk region and on 16 occasions in Luhansk region); the fire was returned twice. By the morning of 2 July four ceasefire violations were registered with no casualties on the Ukrainian side; the fire was not returned. The spokesman of the Ministry of Defence reported at noon no casaulties in the Donbass region on the first day of July. Pro-Russian officials at Donetsk city reported three Ukrainian violations of the ceasefire in three locations using small arms, heavy machine guns, antitank guided missiles, 82 mm mortars, armoured personnel carriers and armoured fighting vehicles. Sources from the self-proclaimed Luhansk People's Republic said that Ukrainian forces broke the ceasefire three times within the republic boundaries. The Ukrainian military employed small arms, heavy machine guns, automatic grenade launchers, 73 mm antitank recoilless rifles, 82 mm mortars, 120 mm mortars and BMP-1 armoured vehicles to pound pro-Russian positions at Slavyanoserbsk, Kalynove, Kalynivka and Lozove. The press-centre of the Joint Forces Operation (JFO) reported in the evening that from 7:00 am to 6:00 pm pro-Russian military had opened fire on positions of Ukrainian troops on 8 occasions, no casualties were reported. By the end of the day total 21 ceasefire violations were registered, as a result, one Ukrainian soldier was wounded. 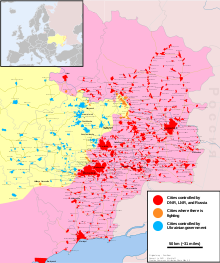 Pisky, in the outskirts of Donetsk city, Vodiane, Hnutove, Lebedinske, Pavlopil, Chermalyk and Shyrokyne, in the region of Mariupol, and in the northern sector of the demarcation line, Zolote, Krymske, Luhanske, Novozvanivka, Novoluhanske and Prichepilivka were attacked by pro-Russian forces. All the incidents involved the use of small arms, heavy machine guns, rocket launchers and rocket-propelled grenades. Pro-Russian authorities at Donetsk city reported by evening that Ukrainian forces had shelled Yasynuvata; one civilian residence was damaged. The press-centre of the press-centre of the JFO reported in the morning that pro-Russian forces had opened fire on 26 occasions on Ukrainian positions the previous day (including on 14 occasions in Donetsk and on 7 occasions in Luhansk region); the fire was not returned. By morning of 3 July three ceasefire violations were registered with no casualties on the Ukrainian side; the fire was not returned. The spokesman of the Ministry of Defence confirmed at noon that one Ukrainian serviceman was wounded in the Donbass region on 2 July. No Ukrainian violations of the ceasefire were reported by pro-Russian officials at Donetsk city. The authorities of the self-proclaimed Luhansk People's Republic also reported that the Ukrainian military had abided by the truce. According to the information provided by the press-centre of the JFO in the evening, as of 6:00 pm pro-Russian troops had opened fire on Ukrainian troops on 2 occasions, no casualties were reported. By the end of the day the number of registered ceasefire violations had risen to 17, with no casualties on the Ukrainian side. Pro-Russian forces opened fire on Ukrainian positions at Avdiivka and Krasnohorivka, in the surroundings of Donetsk city, with small arms, heavy machine guns and grenade launchers. In the region of Mariupol, an antitank guided missile was launched at Vodiane, while infantry weapons and rocket launchers were fired at Lebedinske, Pavlopil, Shyrokyne, Vodiane and Pyshchevik. In the northern sector of the demarcation line, pro-Russian armoured fighting vehicles launched an attack on Ukrainian positions at Krymske and Katerinivka. Novozvanivka and Troitske became the target of small arms, heavy machine guns and grenade launchers. Pro-Russian sources at Donetsk city reported nine Ukrainian violations of the truce by the evening. Spartak, Vasiilivka, Staromykhailivka, Dokuchaievsk, Vesele and Kruta Balka, in the surroundings of Donetsk city, Dolomitne, Gagarin mining complex and Verkhnyotoretske, in the area of Horlivka, and in the region of Mariupol, Uzhivka and Pikuzy, came under hostile fire. Most incidents involved the use of infantry weapons, automatic grenade launchers and antitank rockets; 73 mm antitank recoilless rifles were fired at Gagarin mining complex and Uzhivka, while BMP-1 armoured vehicles from Ukraine's 36th Naval Infantry Brigade engaged pro-Russian positions at Uzhivka. Alexander Zakharchenko, prime minister of the self-styled Donetsk People's Republic denounced that unidentified hackers had launched a cyber attack on the DNR official website (dnr-online.ru). The page was only available in the Russian Federation and other countries, but not in the republic itself. According to the information provided by the press-centre of the JFO headquarters in the morning pro-Russian forces had opened fire on 17 occasions on Ukrainian positions the previous day (including on 11 occasions in Donetsk region and on 6 occasions in Luhansk region); the fire was not returned. By morning of 4 July two ceasefire violations were registered with no casualties on the Ukrainian side; the fire was not returned. The spokesman of the Ministry of Defence at noon no casaulties in the Donbass region on 3 July. Pro-Russian authorities at Donetsk city reported 25 Ukrainian violations of the ceasefire in 11 locations using small arms, snipers, heavy machine guns, automatic grenade launchers, 73 mm antitank recoilless rifles, armoured personnel carriers and armoured fighting vehicles. According to local sources, the Ukrainian military broke the ceasefire three times within the borders of the self-styled Luhansk People's Republic. The Ukrainian military employed small arms, heavy machine guns, automatic grenade launchers, 73 mm antitank recoilless rifles, 82 mm mortars, 120 mm mortars and BMP-1 armoured vehicles to engage pro-Russian positions at Kalynivka, Pryshyb and Pervomaisk. The press-centre of the JFO reported in the evening that from 7:00 am to 6:00 pm pro-Russian military had opened fire on positions of Ukrainian troops on 5 occasions, as a result, two Ukrainian soldiers were wounded. By the end of the day total 19 ceasefire violations were registered, another two Ukrainian servicemen were wounded. In the outskirts of Donetsk city, most incidents involved the use of small arms, heavy machine guns and genade launchers. The separatists employed these weapons to attack Avdiivka, Novomykhailivka and Nevelske. Talakivka was hit by 120 mm mortar fire. In the region of Mariupol, Ukrainian forces at Vodiane, Pavlopil, Shyrokyne and Lebedinske became the target of infantry weapons and antitank rockets. In the northern sector of the demarcation line, pro-Russian armoured fighting vehicles engaged Ukrainian positions at Krymske, supported by 82 mm mortars. Ukrainian forces at Zaitseve, Prichepilivka, Svitlodarsk, Yuzhne and Krymske were also fired at from heavy machine guns and rocket launchers. Small arms fire was reported at Stanytsia Luhanska. Pro-Russian authorities told the press that Ukrainian forces had attacked pro-Russian positions at Abakumove and Vasiilivka, in the area of Donetsk city, using infantry weapons, automatic grenade launchers and antitank rockets. In the same area, BMP-2 armoured fighting vehicles from Novotroitske opened fire on pro-Russian positions at Dokuchaievsk, supported by heavy machine guns, while Verhnyoshyrokivske, in the region of Mariupol, was struck by 82 mm mortar rounds, Nearby Petrovske was shelled with automatic grenade launchers. In the area of Horlivka, antitank rockets landed in Gagarin mining complex. According to the information provided by the spokesman of the Ukrainian operational headquarters in the morning, pro-Russian troops had opened fire on 19 occasions on Ukrainian positions the previous day (including on 10 occasions in Donetsk and on 9 occasions in Luhansk region). By morning of 5 July three ceasefire violations were registered with no casualties on the Ukrainian side. The spokesman of the Ministry of Defence confirmed at noon that four Ukrainian servicemen were wounded in the Donbass region on 4 July. Pro-Russian officials at Donetsk city recorded eight Ukrainian violations of the ceasefire in eight different locations using small arms, automatic grenade launchers, 73 mm antitank recoilless rifles, 82 mm mortars, armoured personnel carriers and armoured fighting vehicles. In the self-proclaimed Luhansk People's Republic, local authorities recorded two Ukrainian attacks on pro-Russian positions. Heavy machine gun fire was reported at Pankivka, while small arms fire and antitank rockets hit pro-Russian defences at Lozove. The press-centre of the JFO reported in the evening that from 7:00 am to 6:00 pm pro-Russian military had opened fire on positions of Ukrainian troops on 6 occasions, no casualties were reported. By the end of the day total 26 ceasefire violations were registered, as a result, one Ukrainian serviceman was wounded by explosion of an IED. In the outskirts of Donetsk city, Novotroitske and Avdiivka were fired at from small arms, heavy machine guns, automatic grenade launchers and rocket launchers. In the region of Mariupol, pro-Russian armoured fighting vehicles from Pikuzy opened fire on Ukrainian positions at Talakivka. The separatists attacked Ukrainian forces at Vodiane, Talakivka and Shyrokyne using infantry weapons, automatic grenade launchers and rocket launchers. Pro-Russian authorities told the press that Ukrainian forces had broken the ceasefire on a number of occasions by evening. Dokuchaievsk and Vasiilivka, in the surroundings of Donetsk city and, in the region of Mariupol, Pikuzy, came under hostile fire. The bulk of the incidents involved the use of infantry weapons, automatic grenade launchers and antitank rockets. Dokuchaievsk was shelled with 120 mm mortars. According to the information provided by the press-centre of the JFO headquarters in the morning pro-Russian forces had opened fire on 26 occasions on Ukrainian positions the previous day (including on 10 occasions in Donetsk region and on 16 occasions in Luhansk region); the fire was returned on 3 occasions. By morning of 6 July four ceasefire violations were registered with no casualties on the Ukrainian side. Three Ukrainian soldiers were killed and another nine were wounded during a battle drill in Rivne Oblast at around 5:55 am 6 July. The spokesman of the Ministry of Defence reported at noon that one Ukrainian serviceman was wounded in the Donbass region on 5 July. Pro-Russian officials at Donetsk city recorded five Ukrainian violations of the ceasefire in five different locations using small arms, automatic grenade launchers and 120 mm mortars. The same sources recorded 49 Ukrainian violations of the truce over the past week. The Ukrainian military fired six tank rounds, 2 antitank guided missiles, 54 82 mm and 120 mm mortar shells and 64 shots from armoured fighting vehicles on the same period. One pro-Russian soldier was killed in action. Officials from the self-proclaimed Luhansk People's Republic reported that Ukrainian forces broke the ceasefire four times within the republic boundaries. The Ukrainian military employed small arms, heavy machine guns, automatic grenade launchers, 73 mm antitank recoilless rifles, 82 mm mortars, 120 mm mortars and BMP-1 armoured vehicles to engage pro-Russian positions at Zholobok, Pryshyb and Lozove. The press-centre of the JFO reported in the evening that from 7:00 am to 6:00 pm pro-Russian military had opened fire on positions of Ukrainian troops on 8 occasions, as a result, one Ukrainian serviceman was wounded by a sniper bullet at Krasnohorivka. By the end of the day total 30 ceasefire violations were registered. In the area around Donetsk city, Ukrainian positions at Avdiivka, Novoselivka, Novotroitske and Kamianka were fired at from small arms, heavy machine guns and rocket launchers. Sniper fire was reported at Krasnohorivka. In the region of Mariupol, Shyrokyne was hit by 82 mm mortar rounds and antitank guided missiles. Infantry weapons and grenade launchers were used to harass Ukrainian troops at Lebedinske, Vodiane, Shyrokyne and Bohdanivka. In the northern section of the demarcation line, pro-Russian armoured fighting vehicles attacked Novhorodske, while Krymske, Troitske, Katerinivka, Yuzhne, Novoluhanske and Svitlodarsk became the target of heavy machine guns and rocket launchers. Pro-Russian sources at Donetsk city reported a number of ceasefire violations by the Ukrainian military throughout the day. Dokuchaievsk, in the outskirts of Donetsk city, Gagarin mining complex, in the area of Horlivka, and in the region of Mariupol Petrovske and Sakhanka were attacked by Ukrainian forces. In the main incidents, Dokuchaievsk was hit by 120 mm mortar rounds, while Sakhanka came under 82 mm mortar fire. According to the information provided by the spokesman of the Ukrainian operational headquarters in the morning, pro-Russian troops had opened fire on 30 occasions on Ukrainian positions the previous day (including on 18 occasions in Donetsk and on 12 occasions in Luhansk region). By morning of 7 July (as of 11:00 am) three ceasefire violations were registered with no casualties on the Ukrainian side. The spokesman of the Ministry of Defence confirmed at noon that one Ukrainian serviceman was wounded in the Donbass region on 6 July. Pro-Russian officials at Donetsk city reported six Ukrainian violations of the ceasefire in six different locations using small arms, automatic grenade launchers, 73 mm antitank recoilless rifles, 82 mm mortars and 120 mm mortars. Sources from the self-proclaimed Luhansk People's Republic said that Ukrainian forces broke the ceasefire once, when automatic grenade launchers were fired at pro-Russian positions near Lozove. The press-centre of the JFO reported in the evening that from 7:00 am to 6:00 pm pro-Russian military had opened fire on positions of Ukrainian troops on 2 occasions, no casualties were reported. By the end of the day total 13 ceasefire violations were registered. In the area around Donetsk city, separatist troops fired infantry weapons and grenade launchers at Ukrainian positions in Krasnohorivka, Novotroitske and Pisky. The same kind of weapons were used in the region of Mariupol to attack Ukrainian forces at Vodiane, Shyrokyne and Pyshchevik. In the northern sector of the demarcation line, Krymske was hit by heavy machine gun fire and antitank rockets. Ukrainian troops at Stari Aidar and Novoluhanske were harassed with small arms fire. Pro-Russian authorities from Donetsk city told the press that Ukrainian forces broke the ceasefire on a number of occasions. The Ukrainian military opened fire at Dokuchaievsk and Staromykhailivka, in the surroundings of Donetsk city, and Sakhanka, in the region of Mariupol. In the main incidents, pro-Russian positions at Sakhanka were shelled with 82 mm mortars, while small arms, automatic grenade launchers, rocket launchers and 73 mm antitank recoilless rifles were fired at Staromykhailivka from Ukrainian positions at Krasnohorivka. Antitank rockets hit pro-Russian redoubts at Dokuchaievsk. According to the information provided by the press-centre of the JFO headquarters in the morning pro-Russian forces had opened fire on 13 occasions on Ukrainian positions the previous day (including on 10 occasions in Donetsk region and on 3 occasions in Luhansk region); the fire was returned on 4 occasions. By morning of 8 July five ceasefire violations were registered with no casualties on the Ukrainian side; the fire was not returned. The spokesman of the Ministry of Defence reported at noon no casualties in the Donbass region on 7 July. Pro-Russian officials at Donetsk city recorded four Ukrainian violations of the ceasefire in three locations using small arms, heavy machine guns, automatic grenade launchers, antitank rockets, 73 mm antitank recoilless rifles and 82 mm mortars. No violations of the ceasefire were reported inside the self-proclaimed Luhansk People's Republic. According to the information provided by the press-centre of the JFO in the evening pro-Russian military had opened fire on positions of Ukrainian troops on 5 occasions between 7:00 am and 6:00 pm, as a result, one Ukrainian serviceman was wounded by a grenade from a GP-25 under-barrel grenade launcher that hit a trench at Pivdenne. By the end of the day total 21 ceasefire violations were registered. In the area around Donetsk city, the separatists opened fire on Ukrainian positions at Avdiivka and Marinka with small arms, heavy machine guns and rocket launchers. In the region of Mariupol, The same kind of weapons were used to harass Ukrainian troops at Vodiane, Lebedinske, Talakivka, Pavlopil and Shyrokyne. Later in the night, pro-Russian armoured fighting vehicles engaged Ukrainian redoubts at Lebedinske, supported by antitank rockets. In the northern section of the demarcation line, pro-Russian forces attacked Ukrainian positions at Krymske and Svitlodarsk with infantry weapons and rocket launchers. Pro-Russian sources at Donetsk city told the press that Ukrainian forces had broken the ceasefire on two occasions by night, when Vesele and Dokuchaievsk, in the outskirts of Donetsk city, were hit by small arms and heavy machine gun fire. Two civilian residences were damaged by tracers. According to the information provided by the spokesman of the Ukrainian operational headquarters in the morning, pro-Russian troops had opened fire on 21 occasions on Ukrainian positions the previous day, exclusively in Donetsk region. The spokesman of the Ministry of Defence confirmed at noon that one Ukrainian serviceman was wounded in the Donbass region on 8 July. Pro-Russian authorities at Donetsk city reported two Ukrainian violations of the truce in two locations, both of them involving small arms and heavy machine guns. For the second consecutive day, no violations of the ceasefire were recorded by local authorities in the self-styled Luhansk People's Republic. The press-centre of the JFO reported in the evening that from 7:00 am to 6:00 pm pro-Russian military had opened fire on positions of Ukrainian troops on 8 occasions, no casualties were reported. By the end of the day total 23 ceasefire violations were registered, as a result, one Ukrainian serviceman was wounded. In the surroundings of Donetsk city, Ukrainian positions at Nevelske, Avdiivka, Novotroitske, Pisky and Opytne were hit by heavy machine gun fire and antitank rockets. Novotroitske also came under attack from armoured fighting vehicles. In the region of Mariupol, pro-Russian armoured fighting vehicles engaged Ukrainian redoubts at Lebedinske, while small arms and grenade launchers were fired at Shyrokyne, Vodiane and Lebedinske. In the northern sector of tbe demarcation line, Svitlodarsk came under intense heavy machine gun fire. The Ukrainian stronghold also became the target of rocket launchers. The separatists used infantry weapons to attack Ukrainian positions at Novozvanivka and Novoluhanske. Pro-Russian officials reported a number of Ukrainian violations of the truce by evening. In the area of Horlivka, Dolomitne was shelled by 73 mm antitank recoilless rifles firing from Novoluhanske; in the region of Mariupol, Uzhivka was hit by 120 mm mortar rounds, while Sakhanka came under attack from BMP-2 armoured fighting vehicles from Lebedinske, supported by 82 mm mortar fire. Sources from the self-proclaimed Luhansk People's Republic announced that OSCE monitors confirmed that Ukrainian troops had occupied the village of Zolote-4, within the buffer zone. The press-centre of the Ministry of Defence reported the following casualties during the past week (the 27th week of 2018, from Monday the 2nd of July until Monday morning of the 9th of July): seven Ukrainian soldiers were wounded in action. According to the information provided by the press-centre of the JFO headquarters in the morning pro-Russian forces had opened fire on 23 occasions on Ukrainian positions the previous day (including on 19 occasions in Donetsk region and on 4 occasions in Luhansk region). By morning of 10 July six ceasefire violations were registered with no casualties on the Ukrainian side. The spokesman of the Ministry of Defence confirmed at noon that one Ukrainian serviceman was wounded in the Donbass region on 9 July. Pro-Russian officials at Donetsk city reported five Ukrainian violations of the ceasefire in four locations using small arms, 73 mm antitank recoilless rifles, 82 mm mortars, 120 mm mortars, armoured personnel carriers and armoured fighting vehicles. Local sources reported that Ukrainian forces broke the ceasefire on one occasion within the borders of the self-proclaimed Luhansk People's Republic, when 73 mm antitank recoilless rifles from Luhanske shelled Kalynivka. The press-centre of the JFO reported in the evening that from 7:00 am to 6:00 pm pro-Russian military had opened fire on positions of Ukrainian troops on 4 occasions, no casualties were reported. By the end of the day total 20 ceasefire violations were registered. Almost all incidents involved the use of small arms, heavy machine guns and different types of rocket launchers. Avdiivka and Opytne, in the outskirts of Donetsk city, Vodiane, Shyrokyne, Hnutove, Lebedinske, Bohdanivka and Pavlopil, in the region of Mariupol, and in the northern sector of the demarcation line, Orekhove, Krymske and Luhanske, came under hostile fire. By evening, pro-Russian authorities at Donetsk city reported a number of Ukrainian violations of the truce. The Ukrainian military opened fire at Vesele, in the surroundings of Donetsk city, in the area of Horlivka Shyroka Balka and, in the region of Mariupol, Uzhivka and Petrovske. In the main incidents, 82 mm mortar volleys landed in Uzhivka, while automatic grenade launchers were fired at Ukrainian forces at Petrovske. According to the information provided by the spokesman of the Ukrainian operational headquarters in the morning, pro-Russian troops had opened fire on 20 occasions on Ukrainian positions the previous day (including on 17 occasions in Donetsk and on 3 occasions in Luhansk region). By morning of 11 July five ceasefire violations were registered with no casualties on the Ukrainian side. The spokesman of the Ministry of Defence reported at noon no casualties in the Donbass region on 10 July. One civilian was injured by shelling in Krasnohorivka. Pro-Russian sources at Donetsk city reported six Ukrainian violations of the ceasefire in five locations using small arms, heavy machine guns, automatic grenade launchers, 73 mm anti-tank recoilless rifles, 82 mm mortars and 120 mm mortars. In the self-proclaimed Luhansk People's Republic, local authorities reported one Ukrainian attack on pro-Russian positions, when Ukrainian forces from Krymske engaged pro-Russian troops at Sentianivka with small arms, heavy machine guns and automatic grenade launchers. The press-centre of the JFO reported in the evening that from 7:00 am to 6:00 pm pro-Russian military had opened fire on positions of Ukrainian troops on 2 occasions, no casualties were reported. By the end of the day total 17 ceasefire violations were registered, as a result, one Ukrainian serviceman was wounded. In the area of Donetsk city, small arms, heavy machine guns and rocket launchers were fired at Avdiivka, Marinka and Krasnohorivka; the same kind of weapons were used to harass Ukrainian troops at Talakivka and Shyrokyne, in the region of Mariupol. Hours later, Shyrokyne came under 82 mm mortar fire. In the northern sector of the demarcation line, Luhanske, Novoluhanske, Krymske and Yuzhne were hit by heavy machine gun fire and antitank rockets. Pro-Russian forces used infantry weapons to engage Ukrainian troops at Stanytsia Luhanska. Pro-Russian officials reported that Ukrainian forces harassed their troops at Holmivsky, in the area of Horlivka, and Bela Kamianka in the region of Mariupol. Holmivsky came under fire from infantry weapons and 73 mm antitank recoilless guns, while pro-Russian positions at Bela Kamianka received small arms fire. According to the information provided by the press-centre of the JFO headquarters in the morning pro-Russian forces had opened fire on 17 occasions on Ukrainian positions the previous day (including on 7 occasions in Donetsk region and on 10 occasions in Luhansk region). By morning of 12 July seven ceasefire violations were registered. The spokesman of the Ministry of Defence confirmed at noon that one Ukrainian serviceman was wounded in the Donbass region on 11 July. Pro-Russian officials at Donetsk city reported two Ukrainian violations of the ceasefire using small arms and 73 mm antitank recoilless rifles. Sources from the self-proclaimed Luhansk People's Republic said that Ukrainian forces broke the ceasefire once, when BMP-1 armoured vehicles from Krymske engaged pro-Russian redoubts at Sokolniki. The press-centre of the JFO reported in the evening that from 7:00 am to 6:00 pm pro-Russian military had opened fire on positions of Ukrainian troops on 6 occasions, as a result, two Ukrainian servicemen were wounded. By the end of the day total 24 ceasefire violations were registered, one more Ukrainian soldier was wounded. In the outskirts of Donetsk city, infantry weapons and grenade launchers were employed to harass Ukrainian troops at Berezove, Marinka, Opytne and Avdiivka. In the region of Mariupol, pro-Russian armoured fighting vehicles launched a sustained attack on Ukrainian redoubts at Pavlopil supported by 82 mm mortar fire. Vodiane was hit by 82 mm mortar rounds. The separatists opened fire on Ukrainian troops at pyshchevik, Talakivka, Vodiane, Pavlopil and Lebedinske. In the northern section of the demarcation line, small arms and heavy machine guns were fired at Ukrainian forces at Troitske and Novoluhanske. Pro-Russian authorities from Donetsk city told the press that Ukrainian forces had broken the ceasefire on two occasions by evening. Early in the morning, small arms and heavy machine guns were fired at pro-Russian positions around Dokuchaievsk, in the outskirts of Donetsk city, while Sosnovske, in the region of Mariupol, became the target of small arms, snipers and automatic grenade launchers. Hours later, Mineralne, north of Donetsk city, and Vasiilivka, in the area of Horlivka, were hit by 82 mm mortar volleys. In the region of Mariupol, Uzhivka was shelled with 120 mm mortars. BMP-1 armoured fighting vehicles from the 24th Mechanized Brigade opened fire on pro-Russian positions at Vasiilivka supported by small arms and rocket launchers. According to the information provided by the spokesman of the Ukrainian operational headquarters in the morning, pro-Russian troops had opened fire on 24 occasions on Ukrainian positions the previous day (including on 22 occasions in Donetsk and on 2 occasions in Luhansk region) By morning of 13 five ceasefire violations were registered, exclusively in Donetsk region, with no casualties on the Ukrainian side. The spokesman of the Ministry of Defence confirmed at noon that three Ukrainian servicemen were wounded in the Donbass region on 12 July. Pro-Russian officials at Donetsk city recorded nine Ukrainian violations of the ceasefire in seven different locations using small arms, heavy machine guns, automatic grenade launchers, 73 mm antitank recoilless rifles, 82 mm mortars, 120 mm mortars, armoured personnel carriers and armoured fighting vehicles. The same sources recorded 34 Ukrainian violations of the truce over the past week. The Ukrainian military fired 79 shells from 82 mm and 120 mm mortars on the same period. No violations of the ceasefire were recorded by pro-Russian officials from the self-styled Luhansk People's Republic. The press-centre of the JFO reported in the evening that from 7:00 am to 6:00 pm pro-Russian military had opened fire on positions of Ukrainian troops on 7 occasions, as a result, one Ukrainian serviceman was wounded. By the end of the day the number of registered ceasefire violations had risen to 24, another Ukrainian soldier was wounded. In the area around Donetsk city, Ukrainian positions at Marinka, Opytne, Kamianka and Pisky became the target of infantry weapons and rocket launchers. In the region of Mariupol, 120 mm mortar rounds landed in the Ukrainian strongholds of Vodiane and Shyrokyne. Small arms, heavy machine guns and grenade launchers were fired at Ukrainian troops around Talakivka, Shyrokyne, Hnutove, Vodiane and Pyshchevik. In the northern sector of the demarcation line, pro-Russian armoured fighting vehicles opened fire on Ukrainian redoubts at Kriakivka and Novoluhanske, while Krymske was targeted by antitank rocket launchers. Novoluhanske was also shelled with 82 mm mortars. Pro-Russian sources at Donetsk city reported a number of Ukrainian violations of the truce throughout the day. In the main incidents, Uzhivka, in the region of Mariupol, was hit by 120 mm mortar barrages, while the area of Volvo Center, in the western outskirts of Donetsk city, came under antitank rocket fire. According to the information provided by the press-centre of the JFO headquarters in the morning pro-Russian forces had opened fire on 24 occasions on Ukrainian positions the previous day (including on 18 occasions in Donetsk region and on 6 occasions in Luhansk region); the fire was returned on 6 occasions. By morning of 14 July five ceasefire violations were registered with no casualties on the Ukrainian side. The spokesman of the Ministry of Defence confirmed at noon that two Ukrainian servicemen were wounded in action in the Donbass region on 13 July. Pro-Russian sources at Donetsk city reported four Ukrainian violations of the ceasefire in four different locations using small arms, automatic grenade launchers, antitank rocket launchers and 120 mm mortars. Officials from the self-proclaimed Luhansk People's Republic reported that Ukrainian forces broke the ceasefire two times within the republic boundaries. The Ukrainian military employed small arms, heavy machine guns, automatic grenade launchers, 73 mm antitank recoilless rifles and 82 mm mortars to attack pro-Russian positions at Zholobok and Sokolniki. The press-centre of the JFO reported in the evening that from 7:00 am to 6:00 pm pro-Russian military had opened fire on positions of Ukrainian troops on 5 occasions, as a result, one Ukrainian serviceman was wounded. By the end of the day total 24 ceasefire violations were registered, another Ukrainian serviceman was wounded. In the surroundings of Donetsk city, pro-Russian forces opened fire with small arms, heavy machine guns and grenade launchers on Ukrainian positions at Marinka, Avdiivka, Pisky and Krasnohorivka. The same kind of weapons were used to harass Ukrainian troops at Talakivka, Hnutove, Pavlopil, Shyrokyne and Vodiane. Shyrokyne was also shelled with 120 mm mortars. In the northern sector of the demarcation line, Novoluhanske, Krymske, Novotoshkivke and Zalizne became the target of infantry weapons and rocket launchers. Pro-Russian authorities told the press by evening that Ukrainian forces from Novotroitske had shelled Dokuchaievsk, south of Donetsk city, with automatic grenade launchers and antitank rocket launchers. Vasiilivka was also hit from infantry weapons and automatic grenade launchers. According to the information provided by the spokesman of the Ukrainian operational headquarters in the morning, pro-Russian troops had opened fire on 23 occasions on Ukrainian positions the previous day (including on 13 occasions in Donetsk and on 10 occasions in Luhansk region); the fire was returned on 5 occasions. By morning of 15 July seven ceasefire violations were registered with no casualties on the Ukrainian side; the fire was returned twice. The spokesman of the Ministry of Defence confirmed at noon that two Ukrainian servicemen were wounded in the Donbass region on 14 July. Pro-Russian officials in Donetsk city recorded three Ukrainian violations of the truce. The Ukrainian military used small arms, heavy machine guns, automatic grenade launchers and antitank rocket launchers to attack pro-Russian positions at Dokuchaievsk and Vasiilivka. Officials from the self-proclaimed Luhansk People's Republic reported that Ukrainian forces broke the ceasefire three times within the republic boundaries. The Ukrainian military employed small arms, 73 mm antitank recoilless rifles, 82 mm mortars and BMP-1 armoured vehicles to engage pro-Russian positions at Zholobok, Slavyanoserbsk and Sokolniki. The press-centre of the JFO reported in the evening that from 7:00 am to 6:00 pm pro-Russian military had opened fire on positions of Ukrainian troops on 5 occasions, no casualties were reported. By the end of the day total 29 ceasefire violations were registered, as a result, one Ukrainian serviceman was wounded. In the area around Donetsk city, Ukrainian troops at Avdiivka, Taramchuk and Pisky were harassed with small arms fire, heavy machine gun fire and rocket propelled grenades. In the region of Mariupol, 82 mm mortar volleys landed in Hnutove and Lebedinske, while infantry weapons and rcoket launchers were fired at Ukrainian positions around Talakivka, Pyshchevik, Vodiane and Shyrokyne. In the northern section of the demarcation line, Ukrainian positions at Krymske, Zaitseve, Mayorsk, Svitlodarsk and Novoluhanske were hit by small arms fire, heavy machine guns fire and antitank rockets. According to the information provided by the press-centre of the JFO headquarters in the morning pro-Russian forces had opened fire on 29 occasions on Ukrainian positions the previous day (including on 16 occasions in Donetsk region and on 13 occasions in Luhansk region). By morning of 16 July seven ceasefire violations were registered with no casualties on the Ukrainian side. The spokesman of the Ministry of Defence confirmed at noon that one Ukrainian serviceman was wounded in the Donbass region on 15 July. Pro-Russian officials in Donetsk city recorded two Ukrainian violations of the truce. The Ukrainian military used small arms, automatic grenade launchers and antitank recoilless rifles to attack pro-Russian positions at Yelenivka and Holmivsky. Sources from the self-proclaimed Luhansk People's Republic reported that Ukrainian forces broke the ceasefire twice within the republic boundaries. The Ukrainian military employed small arms, automatic grenade launchers, 73 mm antitank recoilless rifles, 82 mm mortars and BMP-1 armoured vehicles to engage pro-Russian positions at Sokolniki and Kalynove. The press-centre of the JFO reported in the evening that from 7:00 am to 6:00 pm pro-Russian forces had opened fire on positions of Ukrainian troops on 5 occasions, no casualties were reported. By the end of the day total 19 ceasefire violations were registered, as a result, one Ukrainian serviceman was wounded. In the outskirts of Donetsk city, Avdiivka, Krasnohorivka, Marinka, Opytne and Nevelske became the target of infantry weapons and rocket launchers. In the region of Mariupol, Lebedinske was hit by 82 mm mortar fire. The separatists fired small arms, heavy machine guns and grenade launchers at Shyrokyne, Hnutove, Lebedinske and Vodiane. In the northern sector of the demarcation line, small arms fire and antitank rockets hit Ukrainian positions at Svitlodarsk and Krymske. Pro-Russian authorities from Donetsk city told the press that Ukrainian forces had broken the ceasefire on a series of occasions throughout the day. Dokuchaievsk, Trudivske and Spartak, in the outskirts of Donetsk city, and Petrovske, in the region of Mariupol, came under attack. In the main incidents, BMP-2 armoured fighting vehicles from Novotroitske launched an attack on Dokuchaievsk, which later became the target of 120 mm mortars. The village was also hit by a single antitank guided missile; one female civilian was wounded and four civilian residences damaged. Spartak was shelled with 73 mm antitank recoilless rifles and 120 mm mortars. Petrovske and Trudivske were likewise targeted by automatic grenade launchers. According to the information provided by the spokesman of the Ukrainian operational headquarters in the morning, pro-Russian troops had opened fire on 19 occasions on Ukrainian positions the previous day (including on 16 occasions in Donetsk and on 3 occasions in Luhansk region). By morning of 17 July two ceasefire violations were registered; one Ukrainian soldier was killed in action at around 8:00 am. The spokesman of the Ministry of Defence confirmed at noon that one Ukrainian serviceman was wounded in the Donbass region on 16 July. Pro-Russian officials at Donetsk city reported seven Ukrainian violations of the ceasefire in four locations using small arms, heavy machine guns, automatic grenade launchers, 73 mm antitank recoilless rifles, 82 mm mortars, 120 mm mortars, antitank guided missiles, armoured personnel carriers and armoured fighting vehicles. Local officials reported that Ukrainian forces broke the ceasefire two times within the boundaries of the self-proclaimed Luhansk People's Republic. The Ukrainian military employed small arms, heavy machine guns, antitank rocket launchers and 73 mm antitank recoilless rifles to attack pro-Russian positions at Slavyanoserbsk and Sokolniki. Two pro-Russian soldiers were killed in action by snipers. The press-centre of the JFO reported in the evening that from 7:00 am to 6:00 pm pro-Russian military had opened fire on positions of Ukrainian troops on 6 occasions, as a result, one Ukrainian serviceman was killed (at around 8:00 am) and another wounded. By the end of the day the number of registered ceasefire violations had risen to 21, another Ukrainian soldier was wounded. In the area of Donetsk city, pro-Russian infantry harassed Ukrainian troops at Avdiivka, Pisky and Kamianka by firing small arms, heavy machine guns and rocket launchers. The same kind of weapons were used in the region of Mariupol to attack Vodiane, Talakivka, Hnutove, Pyshchevik and Shyrokyne. In the northern section of the demarcation line, Orekhove, Zalizne, Krymske and Novoluhanske came under small arms and rocket fire. Pro-Russian sources from Donetsk city reported a number of Ukrainian violations of the truce. The main incidents occurred in the area of Donetsk city and Mariupol. BMP-1 and BMP-2 armoured fighting vehicles from Novotroitske engaged pro-Russian positions at Dokuchaievsk, supported by antitank grenade launchers, while 82 mm mortar volleys landed near Yasynuvata. Pikuzy was shelled at dusk from 120 mm mortars. There were unconfirmed reports of Ukrainian tanks shelling pro-Russian redoubts at Spartak and infantry weapons firing on pro-Russian troops west of Horlivka. According to the information provided by the press-centre of the JFO headquarters in the morning pro-Russian forces had opened fire on 21 occasions on Ukrainian positions the previous day (including on 14 occasions in Donetsk region and on 7 occasions in Luhansk region). By morning of 18 July seven ceasefire violations were registered with no casualties on the Ukrainian side. The spokesman of the Ministry of Defence confirmed at noon that one Ukrainian serviceman was killed and another two were wounded in the Donbass region on 17 July. Pro-Russian officials at Donetsk city recorded nine Ukrainian violations of the ceasefire in seven different locations using small arms, heavy machine guns, automatic grenade launchers, 73 mm antitank recoilless rifles, 120 mm mortars, armoured personnel carriers and armoured fighting vehicles. One pro-Russian serviceman was killed in action and another wounded. Sources from the self-proclaimed Luhansk People's Republic reported that Ukrainian forces broke the ceasefire three times within the republic boundaries. The Ukrainian military employed small arms, automatic grenade launchers, antitank rocket launchers, 73 mm antitank recoilless rifles, 82 mm mortars to attack pro-Russian positions at Zholobok, Pryshyb and Kalynivka. The press-centre of the JFO reported in the evening that from 7:00 am to 6:00 pm pro-Russian military had opened fire on positions of Ukrainian troops once, at Pivdenne; no casualties were reported. By the end of the day total 17 ceasefire violations were registered with no casualties on the Ukrainian side. In the surroundings of Donetsk city, pro-Russian forces fired small arms, heavy machine guns and grenade launchers to harass Ukrainian troops at Avdiivka and Marinka. In the region of Mariupol, pro-Russian armoured fighting vehicles opened fire on Ukrainian redoubts at Vodiane. Ukrainian positions at Lebedinske and Starohnativka became the target of infantry weapons and rocket launchers. In the northern section of the demarcation line, Luhanske and Svitlodarsk came under 82 mm mortar fire. Troitske, Orekhove, Svitlodarsk and Yuzhne were hit by small arms fire, heavy machine guns and antitank rockets. Pro-Russian infantry entrenched on Knyaz Igor memorial fired small arms at Ukrainian positions near Stanytsia Luhanska. Pro-Russian authorities from Donetsk city told the press that the Ukrainian army had broken the truce on several occasions throughout the day. The main incidents took place in the surroundings of Donetsk city, at Dokuchaievsk, Yasynuvata Spartak and, in the area of Horlivka, Holmivsky. Dokuchaievsk became the target of 82 mm and 120 mm mortars, while 82 mm mortar rounds landed in Yasynuvata and Homivsky. Ukrainian positions at Dokuchaievsk were also attacked by BMP-2 armoured vehicles from Novotroitske. Spartak was shelled with automatic grenade launchers and 73 mm antitank recoilless rifles firing from Avdiivka. According to the information provided by the spokesman of the Ukrainian operational headquarters in the morning, pro-Russian troops had opened fire on 17 occasions on Ukrainian positions the previous day (including on 8 occasions in Donetsk and on 9 occasions in Luhansk region). By morning of 19 July five ceasefire violations were registered. The spokesman of the Ministry of Defence reported at noon no casualties in the Donbass region on 18 July. Pro-Russian officials at Donetsk city recorded seven Ukrainian violations of the ceasefire in five different locations using small arms, automatic grenade launchers, 73 mm antitank recoilless rifles, 82 mm mortars, armoured personnel carriers and armoured fighting vehicles. Sources from the self-proclaimed Luhansk People's Republic said that Ukrainian forces broke the ceasefire once, when 73 mm antitank recoilless rifles were fired at pro-Russian positions near Lozove. The press-centre of the JFO reported in the evening that from 7:00 am to 6:00 pm pro-Russian military had opened fire on positions of Ukrainian troops on 5 occasions, no casualties were reported. By the end of the day total 18 ceasefire violations were registered. In all cases, separatist forces opened fire with small arms, heavy machine guns and rocket launchers. Novotroitske, Novomykhailivka, Avdiivka, Kamianka and Pisky, in the outskirts of Donetsk city, Vodiane, Lebedinske, Hnutove and Shyrokyne, in the region of Mariupol, and in the northern sector of the demarcation line, Svitlodarsk, Zhovte, Krymske, Mayorsk and Luhanske. A series of Ukrainian violations of the ceasefire were reported by pro-Russian authorities at Donetsk city by evening. Dokuchaievsk and Novomykhailivka, in the outskirts of Donetsk city, and Pikuzy, in the region of Mariupol, came under hostile fire. In the main incidents, BMP-2 armoured vehicles engaged Ukrainian forces at Dokuchaievsk and Pikuzy, while Novomykhailivka became the target of automatic grenade launchers and antitank rocket launchers. The dolomite processing plant at Dokuchaievsk was damaged. According to the information provided by the press-centre of the JFO headquarters in the morning pro-Russian forces had opened fire on 18 occasions on Ukrainian positions the previous day (including on 12 occasions in Donetsk region and on 6 occasions in Luhansk region); the fire was returned on several occasions. By morning of 20 July two ceasefire violations were registered, as a result, one Ukrainian serviceman was wounded. The spokesman of the Ministry of Defence reported at noon no casualties in the Donbass region on 19 July. Pro-Russian officials at Donetsk city recorded four Ukrainian violations of the ceasefire in three different locations using small arms, heavy machine guns, automatic grenade launchers, 73 mm antitank recoilless rifles, 120 mm mortars, armoured personnel carriers and armoured fighting vehicles. The same sources reported 30 Ukrainian violations for the past week. Ukrainian forces fired 44 shells from 82 mm and 120 mm mortars and 232 rounds from armoured fighting vehicles. One pro-Russian soldier was killed in action and another wounded. Two civilian residents were injured. In the self-proclaimed Luhansk People's Republic, local authorities recorded two Ukrainian attacks on pro-Russian positions. Automatic grenade launchers and 73 mm antitank recoilless rifles were fired at Sentianivka and Lozove. The press-centre of the JFO reported in the evening that from 7:00 am to 6:00 pm pro-Russian military had opened fire on positions of Ukrainian troops on 8 occasions, no casualties were reported. By the end of the day total 29 ceasefire violations were registered, as a result, another two Ukrainian servicemen were wounded. In the outskirts of Donetsk city, infantry weapons and grenade launchers were used to engage Ukrainian positions at Krasnohorivka, Avdiivka, Novomykhailivka, Marinka and Berezove. Sniper fire was recorded at Krasnohorivka. In the region of Mariupol, antitank guided missiles were launched at Pavlopil. Hnutove was meanwhile shelled with 120 mm mortars. The separatists fired small arms, heavy machine guns and rocket launchers at Lebedinske, Shyrokyne, Bohdanivka, Vodiane, Pavlopil and Talakivka. In the northern section of the demarcation line, pro-Russian infantry attacked Ukrainian positions at Troitske, Svitlodarsk and Luhanske with small arms, heavy machine guns and rocket launchers. Pro-Russian sources at Donetsk city reported several Ukrainian violations of the ceasefire throughout the day. Ukrainian forces attacked Dokuchaievsk, Yasne and Trudivske, in the outskirts of Donetsk city, Zaitseve, in the area of Horlivka, and in the region of Mariupol, Sosnovske, Pikuzy and Uzhivka. In the main incidents, a single 82 mm mortar round damaged a civilian residence at Zaitseve, while BMP-2 armoured vehicles from Novotroitske raked Ukrainian positions at Dokuchaievsk with 30 mm gunfire. An industrial depot and an electric locomotive were damaged. BMP-1 and BMP-2 armoured vehicles from Berezove also launched an attack on nearby Yasne. Pro-Russian positions at Pikuzy were engaged by BMP-2 armoured vehicles from Hnutove. According to the information provided by the spokesman of the Ukrainian operational headquarters in the morning, pro-Russian troops had opened fire on 29 occasions on Ukrainian positions the previous day (including on 22 occasions in Donetsk and on 7 occasions in Luhansk region). By morning of 21 July four ceasefire violations were registered with no casualties on the Ukrainian side. The spokesman of the Ministry of Defence confirmed at noon that three Ukrainian servicemen were wounded in the Donbass region on 20 July. Pro-Russian authorities at Donetsk city recorded seven Ukrainian violations of the ceasefire in seven different locations using small arms, heavy machine guns, automatic grenade launchers, 73 mm antitank recoilless rifles, 82 mm mortars, armoured personnel carriers and armoured fighting vehicles. Sources from the self-proclaimed Luhansk People's Republic said that Ukrainian forces broke the ceasefire once, when Kalynove was fired at from heavy machine guns and 73 mm antitank recoilless rifles. The press-centre of the JFO reported in the evening that from 7:00 am to 6:00 pm pro-Russian military had opened fire on positions of Ukrainian troops on 4 occasions, no casualties were reported. By the end of the day total 15 ceasefire violations were registered. In the area of Donetsk city, pro-Russian troops fired infantry weapons and grenade launchers at Avdiivka, Pisky and Krasnohorivka. In the region of Mariupol, the separatists opened fire on Ukrainian troops at Lebedinske, Talakivka, Shyrokyne and Pavlopil. Lebedinske was also the target of 82 mm mortars. In the northern sector of the demarcation line, Ukrainian forces at Prichepilivka, Krymske and Mayorsk were harassed with small arms, heavy machine guns and rocket launchers. A series of ceasefire violations carried out by Ukrainian forces were recorded by pro-Russian officials at Donetsk city. Sakhanka and Pikuzy, in the region of Mariupol, and Yasynuvata, in the northern outskirts of Donetsk city, came under hostile fire in several occasions throughout the day. In the main incidents, Pikuzy was shelled from 73 mm antitank recoilless rifles and 120 mm mortars, while Sakhanka was likewise the target of 73 mm antitank recoilless rifles and 82 mm mortars. Yasynuvata was hit by 120 mm mortar rounds. According to the information provided by the press-centre of the JFO headquarters in the morning pro-Russian forces had opened fire on 15 occasions on Ukrainian positions the previous day (including on 11 occasions in Donetsk region and on 4 occasions in Luhansk region); the fire was returned on 6 occasions. By morning of 22 July five ceasefire violations were registered with no casualties on the Ukrainian side; the fire was not returned. The spokesman of the Ministry of Defence reported at noon no casualties in the Donbass region on 21 July. Pro-Russian officials at Donetsk city reported nine Ukrainian violations of the ceasefire in four different locations using small arms, heavy machine guns, automatic grenade launchers, 73 mm antitank recoilless rifles, 82 mm and 120 mm mortars. Sources from the self-proclaimed Luhansk People's Republic said that Ukrainian forces broke the ceasefire once, when antitank rockets landed in Lozove. The press-centre of the JFO reported in the evening that from 7:00 am to 6:00 pm pro-Russian military had opened fire on positions of Ukrainian troops on 4 occasions, as a result, one Ukrainian serviceman was wounded. By the end of the day total 15 ceasefire violations were registered. In the area around Donetsk city, pro-Russian armoured fighting vehicles engaged Ukrainian positions at Avdiivka. Kamianka and Marinka were hit by small arms fire and antitank rockets. In the region of Mariupol, antitank guided missiles were fired at Hnutove, while armoured fighting vehicles opened fire on Ukrainian redoubts at Starohnativka. Talakivka, Vodiane, Shyrokyne, Hnutove, Lebedinske and Starohnativka became the target of small arms and rocket launchers. In the northern section of the demarcation line, Ukrainian forces at Zaitseve and Krymske were attacked with infantry weapons and rocket launchers. Ukrainian troops at Mayorsk received small arms fire. Sniper fire was reported at Novooleksandrivka. Pro-Russian authorities from Donetsk city told the press that Ukrainian forces had broken the ceasefire several times by evening. In the main incidents, BMP-2 armoured vehicles from Hnutove riddled pro-Russian positions at Novyboeve with 30 mm gunfire, and Sakhanka was shelled with 82 mm mortars. BMP-1 armoured vehicles from Talakivka opened fire on Pikuzy. According to the information provided by the spokesman of the Ukrainian operational headquarters in the morning, pro-Russian troops had opened fire on 15 occasions on Ukrainian positions the previous day (including on 12 occasions in Donetsk and on 3 occasions in Luhansk region). By morning of 23 July three ceasefire violations were registered with no casualties on the Ukrainian side. The spokesman of the Ministry of Defence confirmed at noon that one Ukrainian serviceman was wounded in the Donbass region on 22 July. Pro-Russian officials at Donetsk city recorded six Ukrainian violations of the ceasefire in four different locations using small arms, heavy machine guns, automatic grenade launchers, 73 mm antitank recoilless rifles, armoured personnel carriers and armoured fighting vehicles. No ceasefire violations were recorded by local authorities within the borders of the self-proclaimed Luhansk People's Republic. The press-centre of the JFO reported in the evening that from 7:00 am to 6:00 pm pro-Russian military had opened fire on positions of Ukrainian troops once, with no casualties on the Ukrainian side. By the end of the day total 21 ceasefire violations were registered, as a result, two Ukrainian servicemen were wounded. In the outskirts of Donetsk city, pro-Russian armoured fighting vehicles opened fire on Ukrainian redoubts at Avdiivka for the second consecutive day. Infantry weapons and grenade launchers were fired at Marinka and Avdiivka. In the region of Mariupol, antitank guided missiles were launched at Hnutove, while armoured fighting vehicles engaged Ukrainian positions at Vodiane. Lebedinske was hit by 82 mm mortar volleys, while 120 mm mortar rounds landed in Talakivka. The separatists also fired small arms, heavy machine guns and rocket launchers at Lebedinske, Pavlopil, Hnutove and Shyrokyne. In the northern sector of the demarcation line, Krymske was shelled with antitank rocket launchers and 82 mm mortars. Mayorsk (48°23′48″N 37°58′32″E﻿ / ﻿48.39667°N 37.97556°E﻿ / 48.39667; 37.97556) became the target of small arms and grenade launchers. Pro-Russian sources from Donetsk city reported a series of Ukrainian violations of the truce by evening. Dokuchaievsk, in the surroundings of Donetsk city, and Sakhanka, Pikuzy and Novoshyrokivske, in the region of Mariupol, came under hostile fire. In the main incidents, BMP-2 armoured vehicles from Nikolaevka and Novotroitske launched two attacks on Ukrainian positions at Dokuchaievsk, while 82 mm mortar rounds landed in Sakhanka and Pikuzy. BMP-2 armoured vehicles from Pyshchevik engaged Ukrainian forces at Novoshyrokivske. According to the information provided by the press-centre of the JFO headquarters in the morning pro-Russian forces had opened fire on 21 occasions on Ukrainian positions the previous day (including on 17 occasions in Donetsk region and on 4 occasions in Luhansk region). By morning of 24 July five ceasefire violations were registered with no casualties on the Ukrainian side. The spokesman of the Ministry of Defence confirmed at noon that two Ukrainian servicemen were wounded in the Donbass region on 23 July. Pro-Russian authorities at Donetsk city recorded seven Ukrainian violations of the ceasefire in four different locations using small arms, heavy machine guns, automatic grenade launchers, 73 mm antitank recoilless rifles, 82 mm mortars, 120 mm mortars, armoured personnel carriers and armoured fighting vehicles. Local sources reported that Ukrainian forces broke the ceasefire on one occasion within the borders of the self-proclaimed Luhansk People's Republic, when Ukrainian forces from Prichepilivka fired at pro-Russian positions around Zholobok with small arms, automatic grenade launchers, rocket launchers and 73 mm antitank recoilless rifles. The press-centre of the JFO reported in the evening that from 7:00 am to 6:00 pm pro-Russian military had opened fire on positions of Ukrainian troops on 6 occasions, no casualties were reported. By the end of the day total 33 ceasefire violations were registered with no casualties on the Ukrainian side. In the surroundings of Donetsk city, 122 mm self-propelled artillery firing from Dokuchaievsk hit Ukrainian positions at Novotroitske. This marked the first use of artillery by pro-Russian sources in weeks. Infantry weapons and rocket launchers were employed to harass Ukrainian troops at Avdiivka, Marinka, Opytne, Pisky and Novotroitske. In the region of Mariupol, heavy shelling was reported at Lebedinske, which became the target of 82 mm mortars, 120 mm mortars and 122 mm self-propelled artillery. Nearby Vodiane became the target of 120 mm mortars and antitank guided missiles. Pro-Russian forces also fired small arms, heavy machine guns and grenade launchers at Shyrokyne, Talakivka, Pavlopil and Lebedinske. In the northern sector of the demarcation line, pro-Russian armoured fighting vehicles engaged Ukrainian forces at Krymske and Luhanske. Pro-Russian infantry attacked Ukrainian redoubts at Yuzhne, Novhorodske, Zalizne, Luhanske and Krymske. Pro-Russian authorities from Donetsk city told the press that Ukrainian forces had broken the ceasefire on several occasions by evening. Dokuchaievsk, in the southern outskirts of Donetsk city, and in the region of Mariupol Uzhivka, Pikuzy and Dzerzhinske, in the region of Mariupol, came under hostile fire. In the main incidents, Uzhivka and Dokuchaievsk were shelled with 120 mm mortars. BMP-2 armoured fighting vehicles from Novotroitske riddled pro-Russian positions at Dokuchaievsk with 30 mm gunfire. BMP-1 armoured vehicles from Vodiane opened fire on Dzerzhinske, supported by 73 mm antitank recoilless rifles. According to the information provided by the spokesman of the Ukrainian operational headquarters in the morning, pro-Russian troops had opened fire on 33 occasions on Ukrainian positions the previous day (including on 19 occasions in Donetsk and on 14 occasions in Luhansk region); the fire was returned on 10 occasions. By morning of 25 July four ceasefire violations were registered with no casualties on the Ukrainian side. The spokesman of the Ministry of Defence reported at noon no casualties in the Donbass region on 24 July. Pro-Russian authorities at Donetsk city recorded six Ukrainian violations of the ceasefire in five different locations using heavy machine guns, automatic grenade launchers, 73 mm antitank recoilless rifles, 120 mm mortars, armoured personnel carriers and armoured fighting vehicles. Sources from the self-proclaimed Luhansk People's Republic reported that Ukrainian forces broke the ceasefire three times within the republic boundaries. The Ukrainian military employed small arms, antitank rocket launchers, 73 mm antitank recoilless rifles, 82 mm mortars to attack pro-Russian positions at Mariivka and Kalynivka. The press-centre of the JFO reported in the evening that from 7:00 am to 6:00 pm pro-Russian military had opened fire on positions of Ukrainian troops on 6 occasions, as a result, one Ukrainian serviceman was wounded. By the end of the day total 24 ceasefire violations were registered, another Ukrainian serviceman was wounded. In the outskirts of Donetsk city and Mariupol, Pisky was shelled with 120 mm mortars. Lebedinske, Shyrokyne, Bohdanivka, Pisky, Opytne, Hnutove, Vodiane, Pavlopil, Marinka and Avdiivka became the target of small arms, heavy machine guns and rocket launchers. In the northern section of the demarcation line, infantry weapons and grenade launcherswere used to harass Ukrainian troops at Luhanske, Yuzhne, Krymske and Novoluhanske. Small arms fire was reported at Stanytsia Luhanska. Pro-Russian sources at Donetsk city reported Ukrainian attacks on Spartak, in the western outskirts of Donetsk city, and Holmivsky, in the area of Horlivka. The Ukrainian military opened fire on pro-Russian positions at Holmivsky with antiaircraft guns and 120 mm mortars, while Spartak came under 73 mm antitank recoilless rifle and 82 mm mortar fire. According to the information provided by the press-centre of the JFO headquarters in the morning pro-Russian forces had opened fire on 24 occasions on Ukrainian positions the previous day (including on 18 occasions in Donetsk region and on 6 occasions in Luhansk region); the fire was returned on about 10 occasions. By morning of 26 July four ceasefire violations were registered with no casualties on the Ukrainian side. The spokesman of the Ministry of Defence confirmed at noon that two Ukrainian servicemen were wounded in the Donbass region on 25 July. Pro-Russian officials at Donetsk city reported three Ukrainian violations of the ceasefire in two locations using antiaircraft guns, 73 mm antitank recoilless rifles, 82 mm mortars and 120 mm mortars. No violations of the truce were reported by authorities of the self-styled Luhansk People's Republic. The press-centre of the JFO reported in the evening that from 7:00 am to 6:00 pm pro-Russian military had opened fire on positions of Ukrainian troops on 9 occasions, as a result, one Ukrainian serviceman was wounded, the report reads. By the end of the day total 32 ceasefire violations were registered, one Ukrainian serviceman was killed in action. In the surroundings of Donetsk city and in the region of Mariupol, pro-Russian armoured fighting vehicles opened fire on Ukrainian redoubts at Pavlopil and Hnutove, while infantry weapons and rocket launchers were fired at Pisky, Chermalyk, Lebedinske, Shyrokyne and Vodiane. In the northern sector of the demarcation line, the separatist fired infantry weapons and rocket launchers at Ukrainian positions around Hirske, Yuzhne, Novoluhanske, Novhorodske, Luhanske, Svitlodarsk and Krymske. Pro-Russian authorities from Donetsk city said that the Ukrainian military broke the ceasefire a number of occasions. In the main incidents, automatic grenade launchers were fired at Yasynuvata, while small arms fire was reported at Pikuzy. According to the information provided by the spokesman of the Ukrainian operational headquarters in the morning, pro-Russian troops had opened fire on 32 occasions on Ukrainian positions the previous day (including on 18 occasions in Donetsk and on 14 occasions in Luhansk region). By morning of 27 July nine ceasefire violations were registered with no casualties on the Ukrainian side. The spokesman of the Ministry of Defence confirmed at noon that one Ukrainian serviceman was killed and another was wounded in action in the Donbass region on 26 July. Pro-Russian authorities at Donetsk city reported three Ukrainian violations of the truce in two locations. The incidents involved the use of 73 mm antitank recoilless rifles, antiaircraft guns, 82 mm and 120 mm mortars. The same sources said that Ukrainian forces broke the ceasefire 39 times over the past week. The Ukrainian military fired 63 shells from 82 mm and 120 mm mortars and 127 rounds from armoured fighting vehicles on the same period. One civilian resident was wounded. In the self-proclaimed Luhansk People's Republic, local authorities recorded two Ukrainian attacks on pro-Russian positions. Ukrainian forces employed automatic grenade launchers and 73 mm antitank recoilless rifles to shell pro-Russian positions at Kalynivka and Lozove. The press-centre of the JFO reported in the evening that from 7:00 am to 6:00 pm pro-Russian military had opened fire on positions of Ukrainian troops on 9 occasions; one Ukrainian serviceman was killed. By the end of the day total 34 ceasefire violations were registered. In the areas around Donetsk city and Mariupol, 82 mm and 120 mm mortar volleys landed in Lebedinske and Vodiane. Small arms, heavy machine guns and rocket launchers were fired at Avdiivka, Pavlopil, Hnutove, Lebedinske, Shyrokyne, Vodiane, Marinka, Krasnohorivka and Novomykhailivka. In the northern section of the demarcation line, pro-Russian armoured fighting vehicles engaged Ukrainian positions at Krymske, while infantry weapons and grenade launchers were employed to harass Ukrainian troops at Mayorsk, Zhovte, Novotoshkivke and Zolote. Pro-Russian officials at Donetsk city told the press that Ukrainian forces attacked pro-Russian positions in the region of Mariupol. In the main incidents, Sakhanka and Uzhivka came under 82 mm mortar fire, while ZU-23-2 antiaircraft guns from Shyrokyne opened fire on pro-Russian forces at Sakhanka. According to the information provided by the press-centre of the JFO headquarters in the morning pro-Russian forces had opened fire on 34 occasions on Ukrainian positions the previous day (including on 21 occasions in Donetsk region and on 13 occasions in Luhansk region); the fire was returned on several occasions. By morning of 28 July four ceasefire violations were registered with no casualties on the Ukrainian side. The spokesman of the Ministry of Defence confirmed at noon that one Ukrainian serviceman was killed in the Donbass region on 27 July. Pro-Russian officials at Donetsk city reported four Ukrainian violations of the ceasefire in two locations using 82 mm mortars, 120 mm mortars and antiaircraft guns. Local authorities from the self-proclaimed Luhansk People's Republic recorded two Ukrainian attacks on pro-Russian positions. Automatic grenade launchers, antitank rocket launchers, 73 mm antitank recoilless rifles and 82 mm mortars were fired at Zholobok and Sokolniki. The press-centre of the JFO reported in the evening that from 7:00 am to 6:00 pm pro-Russian military had opened fire on positions of Ukrainian troops on 4 occasions. In a two-hour skirmish between pro-Russian scouts and Ukrainian troops, that took place at Krymske, two Ukrainian servicemen were killed and another two were wounded. Ukrainian reports claim four pro-Russian fighters dead and eight wounded. The warring parties traded mortar and artillery fire. By the end of the day total 25 ceasefire violations were registered. In the outskirts of Donetsk city and in the region of Mariupol, Hnutove became the target of infantry weapons, rocket propelled grenades and 82 mm mortars. Elsewhere, Small arms, heavy machine guns and grenade launchers were fired at Marinka, Pavlopil, Avdiivka, Pisky, Shyrokyne and Vodiane. In the northern sector of the demarcation line, besides the pro-Russian assault near Krymske, Svitlodarsk was hit by small arms fire and antitank rockets. By evening, pro-Russian sources from Donetsk city reported that Ukrainian forces had broken the ceasefire two times in the surroundings of Donetsk city. In Spartak, two 120 mm mortar rounds struck Ukrainian redoubts, while BMP-2 armoured vehicles from Novotroitske engaged pro-Russian positions at Dokuchaievsk. According to the information provided by the spokesman of the Ukrainian operational headquarters in the morning, pro-Russian troops had opened fire on 25 occasions on Ukrainian positions the previous day (including on 14 occasions in Donetsk and on 11 occasions in Luhansk region); the fire was returned on 7 occasions. By morning of 29 July five ceasefire violations were registered with no casualties on the Ukrainian side, the fire was returned once. The spokesman of the Ministry of Defence confirmed at noon that two Ukrainian servicemen were killed and another two were wounded in action in the Donbass region on 28 July. Pro-Russian officials in Donetsk city recorded three Ukrainian violations of the truce. The Ukrainian military used heavy machine guns, 82 mm mortars, 120 mm mortars and armoured fighting vehicles to attack pro-Russian positions at Dokuchaievsk and Spartak. Sources from the self-proclaimed Luhansk People's Republic said that Ukrainian forces broke the ceasefire three times within the republic boundaries. The Ukrainian military employed small arms, heavy machine guns, automatic grenade launchers, 73 mm antitank recoilless rifles, 82 mm mortars and BMP-2 armoured vehicles to pound pro-Russian positions at Sokolniki and Lozove. The press-centre of the JFO reported in the evening that from 7:00 am to 6:00 pm pro-Russian military had opened fire on positions of Ukrainian troops on 3 occasions, no casualties were reported. By the end of the day total 30 ceasefire violations were registered, as a result, one Ukrainian serviceman was wounded. In the outskirts of Donetsk city and in the region of Mariupol, pro-Russian troops fired infantry weapons and rocket launchers at Shyrokyne, Avdiivka, Marinka, Hnutove, Opytne, Novomykhailivka, Lebedinske and Pavlopil. In the northern sector of the demarcation line, the same kind of weapons were used to harass Ukrainian troops at Yuzhne, Novhorodske and Novoselivka. According to the information provided by the press-centre of the JFO headquarters in the morning pro-Russian forces had opened fire on 30 occasions on Ukrainian positions the previous day (including on 20 occasions in Donetsk region and on 10 occasions in Luhansk region); the fire was returned on several occasions. By morning of 30 July nine ceasefire violations were registered with no casualties on the Ukrainian side. The spokesman of the Ministry of Defence confirmed at noon that one Ukrainian serviceman was wounded in the Donbass region on 29 July. Pro-Russian authorities at Donetsk city said that Ukrainian forces broke the ceasefire once, when two 120 mm mortar shells landed in Spartak, west of Donetsk city. According to local sources, the Ukrainian military broke the ceasefire twice within the borders of the self-styled Luhansk People's Republic. The Ukrainian military employed small arms, automatic grenade launchers, 73 mm antitank recoilless rifles, antitank rocket launchers, 82 mm mortars and BMP-1 armoured vehicles to engage pro-Russian positions at Zholobok and Pryshyb. The press-centre of the JFO reported in the evening that from 7:00 am to 6:00 pm pro-Russian military had opened fire on positions of Ukrainian troops on 10 occasions, as a result, three Ukrainian servicemen were wounded. By the end of the day total 40 ceasefire violations were registered. In the areas around Donetsk city and Mariupol, the Ukrainian stronghold of Vodiane was struck by 82 mm and 120 mm mortar volleys. Opytne, Novomyhailivka, Novotroitske, Pisky, Shyrokyne, Kamianka, Hnutove, Avdiivka, Pavlopil, Lebedinske and Marinka became the target of small arms, heavy machine guns and rocket launchers. In the northern section of the demarcation line, pro-Russian forces fired infantry weapons and antitank rockets at Maisk, Novhorodske, Mayorsk, Svitlodarsk and Krymske. A series of Ukrainian violations of the truce were recorded by pro-Russian officials from Donetsk city by evening. Mineralne and Spartak, in the outskirts of Donetsk city, and in the region of Mariupol Sakhanka, Uzhivka, Pikuzy, Yelenivka and Novoshyrokivske came under hostile fire. In the main incidents, Ukrainian forces fired 120 mm mortars at Spartak and 82 mm mortars at Mineralne, Sakhanka and Uzhivka. Pikuzy and Novoshyrokivske were shelled with automatic grenade launchers. According to the information provided by the spokesman of the Ukrainian operational headquarters in the morning, pro-Russian troops had opened fire on 40 occasions on Ukrainian positions the previous day (including on 28 occasions in Donetsk and on 12 occasions in Luhansk region); the fire was returned on several occasions. By morning of 31 July four ceasefire violations were registered with no casualties on the Ukrainian side. The spokesman of the Ministry of Defence confirmed at noon that three Ukrainian servicemen were wounded in action in the Donbass region on 30 July. Pro-Russian authorities at Donetsk city recorded 11 Ukrainian violations of the ceasefire in seven different locations using small arms, heavy machine guns, snipers, automatic grenade launchers, 73 mm antitank recoilless rifles, 82 mm mortars and 120 mm mortars. Sources from the self-proclaimed Luhansk People's Republic reported that Ukrainian forces broke the ceasefire three times within the republic boundaries. The Ukrainian military employed small arms, heavy machine guns, under-barrel launched grenades, automatic grenade launchers, 73 mm antitank recoilless rifles and 82 mm mortars to engage pro-Russian positions at Pryshyb, Lozove and Sokolniki. One pro-Russian soldier was killed. The press-centre of the JFO reported in the evening that from 7:00 am to 6:00 pm pro-Russian military had opened fire on positions of Ukrainian troops on 9 occasions, as a result, one Ukrainian serviceman was wounded. By the end of the day total 36 ceasefire violations were registered. In the area around Donetsk city and in the region of Mariupol, Opytne, Hnutove, Vodiane, Krasnohorivka, Marinka, Avdiivka, Talakivka, Lebedinske, Novomikhailovka, Pavlopil and Pisky became the target of infantry weapons and rocket launchers. In the northern sector of the demarcation line, the same kind of weapons were used to harass Ukrainian troops at Krymske, Zaitseve, Luhanske and Svitlodarsk. ^ "Зведення щодо обстановки в районі проведення операції Об'єднаних сил станом на 07.00 01 липня 2018 року" (in Ukrainian). MoD. 1 July 2018. Retrieved 1 July 2018. ^ "New truce in Donbas fails as Russian-controlled troops mount two attacks on Ukrainian army | One Ukrainian soldier was wounded in action as a result of hostilities on June 30". UNIAN. 1 July 2018. Retrieved 1 July 2018. ^ "ВСУ четыре раза открывали огонь по территории Республики - СЦКК". Официальный сайт ДНР. 1 July 2018. Retrieved 1 July 2018. ^ "Оперативная сводка от Народной милиции ЛНР за прошедшие сутки 01.07.2018". Социальная сеть Новороссии GOVES. Retrieved 2 July 2018. ^ "Операція об'єднаних сил / Joint forces operation | ЗВЕДЕННЯ СТАНОМ НА 18:00 01 ЛИПНЯ 2018 РОКУ" (in Ukrainian). Press-centre of the JFO HQ. 1 July 2018. Retrieved 1 July 2018. ^ a b "Зведення щодо обстановки в районі проведення операції Об'єднаних сил станом на 07.00 02 липня 2018 року" (in Ukrainian). MoD. 2 July 2018. Retrieved 2 July 2018. ^ "JFO: Ukraine reports 25 enemy attacks in last day | No casualties among Ukrainian troops have been reported over the past day". UNIAN. 2 July 2018. Retrieved 2 July 2018. ^ "Militants violated ceasefire in eastern Ukraine 25 times in last day". Ukrinform. 2 July 2018. Retrieved 2 July 2018. ^ "ВСУ обстреляли поселок Сигнальное - СЦКК". Официальный сайт ДНР. 1 July 2018. Retrieved 1 July 2018. ^ "ВСУ разбили ракетами "КамАЗ", который вез воду - СЦКК". Официальный сайт ДНР. 1 July 2018. Retrieved 1 July 2018. ^ "ВСУ обстреляли Докучаевск и Сигнальное в ДНР". News Front - Новостной Фронт. Новости Мира России Украины (in Russian). Retrieved 2 July 2018. ^ "ВСУ нарушили "хлебное" перемирие - СЦКК". Официальный сайт ДНР. 1 July 2018. Retrieved 1 July 2018. ^ "В Докучаевске повреждены дома по ул. Ленина и Центральная - СЦКК". Официальный сайт ДНР. Retrieved 1 July 2018. ^ "В ЛНР заявили о срыве перемирия украинскими боевиками". News Front - Новостной Фронт. Новости Мира России Украины (in Russian). Retrieved 1 July 2018. ^ "Briefing Ministry of Defence of Ukraine spokesperson on frontline situation". 2018-07-02. 2 July 2018. Retrieved 2 July 2018. ^ "ВСУ использовали против Республики ПТУР и минометы - СЦКК". Официальный сайт ДНР. 2 July 2018. Retrieved 2 July 2018. ^ "ЛНР: оперативная сводка – обстреляны четыре поселка". News Front - Новостной Фронт. Новости Мира России Украины (in Russian). Retrieved 3 July 2018. ^ "Операція об'єднаних сил / Joint forces operation | Зведення станом на 18:00 02 ЛИПНЯ 2018 року" (in Ukrainian). Press-centre of the JFO HQ. 2 July 2018. Retrieved 2 July 2018. ^ a b "Зведення щодо обстановки в районі проведення операції Об'єднаних сил станом на 07.00 03 липня 2018 року" (in Ukrainian). MoD. 2 July 2018. Retrieved 2 July 2018. ^ "JFO: One Ukrainian soldier wounded amid 21 enemy attacks in Donbas in past day | According to intelligence reports, two troops of the Russian occupation forces were wounded". UNIAN. 3 July 2018. Retrieved 3 July 2018. ^ "Militants violated ceasefire in eastern Ukraine 21 times in last day". Ukrinform. 3 July 2018. Retrieved 3 July 2018. ^ "В Ясиноватой обстрелом поврежден жилой дом, пострадавших нет". Официальный сайт ДНР. 2 July 2018. Retrieved 2 July 2018. ^ "Сутки без огня: Безсонов сообщает о запоздавшем начале "хлебного перемирия"". News Front - Новостной Фронт. Новости Мира России Украины (in Russian). Retrieved 3 July 2018. ^ "Свершилось: известие, которого давно ждали в Донбассе". Южный Федеральный. 3 July 2018. Retrieved 3 July 2018. ^ "Операція об'єднаних сил / Joint forces operation | ЗВЕДЕННЯ СТАНОМ НА 18:00 03 ЛИПНЯ 2018 РОКУ" (in Ukrainian). Press-centre of the JFO HQ. 3 July 2018. Retrieved 3 July 2018. ^ "Операція об'єднаних сил / Joint forces operation | Ранкове зведення на 7:00 04 липня 2018 року" (in Ukrainian). Press-centre of the JFO HQ. 4 July 2018. Retrieved 4 July 2018. ^ "Зведення щодо обстановки в районі проведення операції Об'єднаних сил станом на 07.00 04 липня 2018 року" (in Ukrainian). MoD. 4 July 2018. Retrieved 4 July 2018. ^ "JFO: Ukraine reports 17 enemy attacks in last day | No casualties among Ukrainian troops have been reported over the past day". UNIAN. 4 July 2018. Retrieved 4 July 2018. ^ "Militants violated ceasefire in eastern Ukraine 17 times in last day". Ukrinform. 4 July 2018. Retrieved 4 July 2018. ^ "Перемирие на Донбассе девять раз нарушалось киевскими силовиками". Российская газета (in Russian). 3 July 2018. Retrieved 3 July 2018. ^ "Обстановка в ДНР: украинские войска 25 раз нарушили режим прекращения огня". News Front - Новостной Фронт. Новости Мира России Украины (in Russian). Retrieved 5 July 2018. ^ "Wall". vk.com. Retrieved 5 July 2018. ^ "Wall". vk.com. Retrieved 4 July 2018. ^ "ЛНР: оперативная сводка – обстреляны три поселка, потерь нет". News Front - Новостной Фронт. Новости Мира России Украины (in Russian). Retrieved 4 July 2018. ^ "Операція об'єднаних сил / Joint forces operation | Зведення станом на 18:00 04 ЛИПНЯ 2018 РОКУ" (in Ukrainian). Press-centre of the JFO HQ. 4 July 2018. Retrieved 4 July 2018. ^ a b "Ранкове зведення на 7:00 05 липня 2018 року" (in Ukrainian). MoD. 5 July 2018. Retrieved 5 July 2018. ^ "Joint forces report 19 ceasefire violations by Russia proxy forces in past day | A member of an enemy subversive group was killed by a landmine while another six militants were injured in a failed effort to penetrate Ukraine's defenses". UNIAN. 5 July 2018. Retrieved 5 July 2018. ^ "Militants violated ceasefire in eastern Ukraine 19 times in last day". Ukrinform. 5 July 2018. Retrieved 5 July 2018. ^ "ВСУ обстреляли Докучаевск и Коминтерново - СЦКК". Официальный сайт ДНР. 4 July 2018. Retrieved 4 July 2018. ^ "ВСУ обстреляли Петровское, Горловку и Октябрь". Официальный сайт ДНР. 5 July 2018. Retrieved 5 July 2018. ^ "ВСУ за сутки обстреляли два населенных пункта в ЛНР". News Front - Новостной Фронт. Новости Мира России Украины (in Russian). Retrieved 5 July 2018. ^ "ЗВЕДЕННЯ СТАНОМ НА 18:00 05 ЛИПНЯ 2018 РОКУ". www.facebook.com/pressjfo.news (in Ukrainian). JFO. 5 July 2018. Retrieved 5 July 2018. ^ a b "Зведення щодо обстановки в районі проведення операції Об'єднаних сил станом на 07.00 06 липня 2018 року" (in Ukrainian). MoD. 6 July 2018. Retrieved 6 July 2018. ^ "JFO: Ukraine reports 1 WIA amid 26 enemy attacks in Donbas in past day | Ukrainian intelligence reported one enemy troop had been killed". UNIAN. 6 July 2018. Retrieved 6 July 2018. ^ "Militants violated ceasefire in eastern Ukraine 26 times in last day". Ukrinform. 6 July 2018. Retrieved 6 July 2018. ^ "ВСУ обстреляли Васильевку - СЦКК". Официальный сайт ДНР. 5 July 2018. Retrieved 5 July 2018. ^ 24, Донецк. "Зафиксированы обстрелы ВСУ по двум направлениям". Донецк 24 (in Russian). Retrieved 5 July 2018. ^ 24, Донецк. "Зафиксирован обстрел ВСУ по направлению Травневое - Гольмовский". Донецк 24 (in Russian). Retrieved 5 July 2018. ^ "Під час навчань на Рівненському полігоні загинули три та отримали поранення дев'ять військовослужбовців" (in Ukrainian). MoD. 6 July 2018. Retrieved 6 July 2018. ^ "Three Ukrainian Soldiers Die In Training Accident". REF/RL. 6 July 2018. Retrieved 6 July 2018. ^ "ВСУ пять раз нарушили режим прекращения огня - СЦКК". Официальный сайт ДНР. 6 July 2018. Retrieved 5 July 2018. ^ "ВСУ за неделю порядка 50 раз нарушили режим тишины в ДНР". News Front - Новостной Фронт. Новости Мира России Украины (in Russian). Retrieved 8 July 2018. ^ "ВСУ 4 раза нарушили режим тишины в ЛНР". News Front - Новостной Фронт. Новости Мира России Украины (in Russian). Retrieved 7 July 2018. ^ "Операція об'єднаних сил / Joint forces operation | Зведення станом на 18:00 06 ЛИПНЯ 2018 РОКУ" (in Ukrainian). Press-centre of the JFO HQ. 6 July 2018. Retrieved 6 July 2018. ^ a b "Ранкове зведення на 07:00 07 липня 2018 року" (in Ukrainian). MoD. 7 July 2018. Retrieved 7 July 2018. ^ "Joint forces report 30 ceasefire violations by Russia proxy forces in past day | The situation was tense in the Mariupol sector with a large number of enemy provocations". UNIAN. 7 July 2018. Retrieved 7 July 2018. ^ "Militants violated ceasefire in eastern Ukraine 30 times in last day". Ukrinform. 7 July 2018. Retrieved 7 July 2018. ^ "ВСУ обстреляли Докучаевск - СЦКК". Официальный сайт ДНР. 6 July 2018. Retrieved 6 July 2018. ^ a b "Зафиксирован обстрел со стороны ВСУ по Саханке". Официальный сайт ДНР. 6 July 2018. Retrieved 6 July 2018. ^ "Wall". vk.com. Retrieved 7 July 2018. ^ "ЛНР: оперативная сводка – обстрелян поселок Лозовое, жертв нет". News Front - Новостной Фронт. Новости Мира России Украины (in Russian). Retrieved 7 July 2018. ^ "ЗВЕДЕННЯ СТАНОМ НА 18:00 07 ЛИПНЯ 2018 РОКУ". www.facebook.com/pressjfo.news (in Ukrainian). JFO. 7 July 2018. Retrieved 7 July 2018. ^ a b "Зведення щодо обстановки в районі проведення операції Об'єднаних сил станом на 07.00 08 липня 2018" (in Ukrainian). MoD. 8 July 2018. Retrieved 8 July 2018. ^ "Donbas update: Militants violate truce along almost entire contact line | Ukraine reported no losses over the past 24 hours". UNIAN. 8 July 2018. Retrieved 8 July 2018. ^ 24, Донецк. "Зафиксирован обстрел ВСУ по направлению Новотроицкое - Докучаевск". Донецк 24 (in Russian). Retrieved 8 July 2018. ^ 24, Донецк. "Зафиксирован обстрел со стороны ВСУ по направлению Широкино - Саханка". Донецк 24 (in Russian). Retrieved 8 July 2018. ^ 24, Донецк. "Зафиксирован обстрел ВСУ по направлению Красногоровка - Старомихайловка". Донецк 24 (in Russian). Retrieved 8 July 2018. ^ "Wall". vk.com. Retrieved 9 July 2018. ^ "В ЛНР сообщили, что перемирие соблюдается". News Front - Новостной Фронт. Новости Мира России Украины (in Russian). Retrieved 9 July 2018. ^ "Операція об'єднаних сил / Joint forces operation | Зведення станом на 18:00 08 ЛИПНЯ 2018 РОКУ" (in Ukrainian). Press-centre of the JFO HQ. 8 July 2018. Retrieved 8 July 2018. ^ a b c "Брифінг представника Прес-центру Об'єднаних сил 09.07.2018 р." (in Ukrainian). MoD. 9 July 2018. Retrieved 9 July 2018. ^ a b "Ранкове зведення на 07:00 09 липня 2018 року" (in Ukrainian). MoD. 9 July 2018. Retrieved 9 July 2018. ^ "JFO: Ukraine reports 1 WIA amid 21 enemy attacks in Donbas in past day | According to intelligence reports, two occupiers were wounded". UNIAN. 9 July 2018. Retrieved 9 July 2018. ^ "Militants violated ceasefire in eastern Ukraine 21 times in last day". Ukrinform. 9 July 2018. Retrieved 9 July 2018. ^ "ООС: сводные данные – 09 июля 2018 – Информационно-аналитический центр". mediarnbo.org (in Russian). Retrieved 9 July 2018. ^ a b "Украинские каратели сожгли один дом в ДНР". ИА REGNUM (in Russian). Retrieved 9 July 2018. ^ "Огневая группа ВСУ обнаружена на линии соприкосновения — ЛНР". News Front - Новостной Фронт. Новости Мира России Украины (in Russian). Retrieved 9 July 2018. ^ "ЗВЕДЕННЯ СТАНОМ НА 18:00 09 ЛИПНЯ 2018 РОКУ". www.facebook.com/pressjfo.news (in Ukrainian). JFO. 9 July 2018. Retrieved 9 July 2018. ^ "JFO: Ukrainian soldier wounded amid 23 enemy attacks in Donbas in past day | According to intelligence reports, a militant of the Russian occupation forces was killed". UNIAN. 10 July 2018. Retrieved 10 July 2018. ^ "Militants violated ceasefire in eastern Ukraine 23 times in last day". Ukrinform. 10 July 2018. Retrieved 10 July 2018. ^ a b "Зведення щодо обстановки в районі проведення операції Об'єднаних сил станом на 07.00 10 липня 2018" (in Ukrainian). MoD. 10 July 2018. Retrieved 10 July 2018. ^ 24, Донецк. "Зафиксирован обстрел ВСУ по направлению Новолуганское - Доломитное". Донецк 24 (in Russian). Retrieved 9 July 2018. ^ 24, Донецк. "Зафиксированы обстрелы ВСУ по двум направлениям". Донецк 24 (in Russian). Retrieved 9 July 2018. ^ a b "В Горловке обстрелом ВСУ повреждены еще два дома - СЦКК". vk.com. 10 July 2018. Retrieved 11 July 2018. ^ "Миссия ОБСЕ подтвердила, что Золотое-4 находилось под контролем ВСУ". News Front - Новостной Фронт. Новости Мира России Украины (in Russian). Retrieved 9 July 2018. ^ "Оперативная сводка за сутки с 9 на 10 июля от НМ ЛНР". Социальная сеть Новороссии GOVES. Retrieved 11 July 2018. ^ "Операція об'єднаних сил / Joint forces operation | Зведення станом на 18:00 10 ЛИПНЯ 2018 РОКУ року" (in Ukrainian). Press-centre of the JFO HQ. 10 July 2018. Retrieved 10 July 2018. ^ a b "Зведення щодо обстановки в районі проведення операції Об'єднаних сил станом на 07:00 11 липня 2018 року" (in Ukrainian). MoD. 11 July 2018. Retrieved 11 July 2018. ^ "Donbas warzone: Ukraine reports 20 enemy attacks in last day | No casualties among Ukrainian troops have been reported over the past day". UNIAN. 11 July 2018. Retrieved 11 July 2018. ^ "Militants violated ceasefire in eastern Ukraine 20 times in last day". Ukrinform. 11 July 2018. Retrieved 11 July 2018. ^ 24, Донецк. "Зафиксирован обстрел ВСУ по направлению Новгородское - Широкая Балка". Донецк 24 (in Russian). Retrieved 11 July 2018. ^ "Перемирие продолжается: ВСУ обстреляли Ленинское, Весёлое и Петровское". News Front - Новостной Фронт. Новости Мира России Украины (in Russian). Retrieved 11 July 2018. ^ 24, Донецк. "Ежедневная сводка нарушений режима прекращения огня за период с 3:00 10 июля по 3:00 11 июля - СЦКК". Донецк 24 (in Russian). Retrieved 11 July 2018. ^ "Оперативная сводка за сутки с 10 на 11 июля от НМ ЛНР". Социальная сеть Новороссии GOVES. Retrieved 11 July 2018. ^ "ЗВЕДЕННЯ СТАНОМ НА 18:00 11 ЛИПНЯ 2018 РОКУ". www.facebook.com/pressjfo.news (in Ukrainian). JFO. 11 July 2018. Retrieved 11 July 2018. ^ a b "Зведення щодо обстановки в районі проведення операції Об'єднаних сил станом на 07.00 12 липня 2018" (in Ukrainian). MoD. 12 July 2018. Retrieved 12 July 2018. ^ "JFO: Ukraine reports 1 WIA amid 17 enemy attacks in Donbas in past day | According to intelligence reports, two occupiers were wounded". UNIAN. 12 July 2018. Retrieved 12 July 2018. ^ "Militants violated ceasefire in eastern Ukraine 17 times in last day". Ukrinform. 12 July 2018. Retrieved 12 July 2018. ^ a b 24, Донецк. "Ежедневная сводка нарушений режима прекращения огня за период с 3:00 11 июля по 3:00 12 июля - СЦКК". Донецк 24 (in Russian). Retrieved 12 July 2018. ^ 24, Донецк. "Оперативная сводка за сутки с 11 на 12 июля от НМ ЛНР". Донецк 24 (in Russian). Retrieved 12 July 2018. ^ "Операція об'єднаних сил / Joint forces operation | Зведення станом на 18:00 12 ЛИПНЯ 2018 РОКУ року" (in Ukrainian). Press-centre of the JFO HQ. 12 July 2018. Retrieved 12 July 2018. ^ a b "Зведення щодо обстановки в районі проведення операції Об'єднаних сил станом на 07:00 13 липня 2018 року" (in Ukrainian). MoD. 13 July 2018. Retrieved 13 July 2018. ^ "Donbas update: Ukraine reports 3 WIAs amid 24 enemy attacks | According to intelligence reports, two occupiers were killed and three others wounded". UNIAN. 13 July 2018. Retrieved 13 July 2018. ^ "Militants violated ceasefire in eastern Ukraine 24 times in last day". Ukrinform. 13 July 2018. Retrieved 13 July 2018. ^ 24, Донецк. "Зафиксирован обстрел ВСУ по направлению Новотроицкое - Докучаевск". Донецк 24 (in Russian). Retrieved 12 July 2018. ^ 24, Донецк. "Зафиксирован обстрел ВСУ по направлению Павлополь - Сосновское". Донецк 24 (in Russian). Retrieved 12 July 2018. ^ "ВСУ усилили обстрелы территорий ДНР – Басурин". News Front - Новостной Фронт. Новости Мира России Украины (in Russian). Retrieved 13 July 2018. ^ 24, Донецк. "Ежедневная сводка нарушений режима прекращения огня за период с 3:00 12 июля по 3:00 13 июля - СЦКК". Донецк 24 (in Russian). Retrieved 13 July 2018. ^ "ВСУ более тридцати раз за неделю обстреливали территорию ДНР". News Front - Новостной Фронт. Новости Мира России Украины (in Russian). Retrieved 15 July 2018. ^ 24, Донецк. "Оперативная сводка за сутки с 12 на 13 июля от НМ ЛНР". Донецк 24 (in Russian). Retrieved 13 July 2018. ^ "ЗВЕДЕННЯ СТАНОМ НА 18:00 13 ЛИПНЯ 2018 РОКУ". www.facebook.com/pressjfo.news (in Ukrainian). JFO. 13 July 2018. Retrieved 13 July 2018. ^ a b "Зведення щодо обстановки в районі проведення операції Об'єднаних сил станом на 07.00 14 липня 2018" (in Ukrainian). MoD. 14 July 2018. Retrieved 14 July 2018. ^ "JFO: Ukraine reports 2 WIAs amid 24 enemy attacks in Donbas in past day | According to intelligence reports, four occupiers were wounded". UNIAN. 14 July 2018. Retrieved 14 July 2018. ^ "Two Ukrainian soldiers wounded in Donbas". Ukrinform. 14 July 2018. Retrieved 14 July 2018. ^ 24, Донецк. "Зафиксирован обстрел ВСУ по направлению Водяное - Ленинское". Донецк 24 (in Russian). Retrieved 13 July 2018. ^ "Wall". vk.com. Retrieved 13 July 2018. ^ "ЕЖЕДНЕВНАЯ СВОДКА НАРУШЕНИЙ РЕЖИМА ПРЕКРАЩЕНИЯ ОГНЯ ЗА ПЕРИОД С 3:00 13 ИЮЛЯ ПО 3:00 14 ИЮЛЯ". Социальная сеть Новороссии GOVES. Retrieved 14 July 2018. ^ "ЛНР: оперативная сводка — обстреляны Сокольники и Желобок". News Front - Новостной Фронт. Новости Мира России Украины (in Russian). Retrieved 14 July 2018. ^ "Операція об'єднаних сил / Joint forces operation | Зведення станом на 18:00 14 ЛИПНЯ 2018 РОКУ року" (in Ukrainian). Press-centre of the JFO HQ. 14 July 2018. Retrieved 14 July 2018. ^ a b "Зведення щодо обстановки в районі проведення операції Об'єднаних сил станом на 07:00 15 липня 2018 року" (in Ukrainian). MoD. 15 July 2018. Retrieved 15 July 2018. ^ правды», Цесанна АНТОНЕНКО | Сайт «Комсомольской (14 July 2018). "После непродолжительно затишья, Докучаевск опять пострадал от обстрела". KP.RU - сайт «Комсомольской правды» (in Russian). Retrieved 14 July 2018. ^ a b "ВСУ обстреливали Васильевку и Докучаевск - СЦКК". vk.com. Retrieved 15 July 2018. ^ "Оперативная сводка за сутки с 14 на 15 июля от НМ ЛНР". Социальная сеть Новороссии GOVES. Retrieved 15 July 2018. ^ "ЗВЕДЕННЯ СТАНОМ НА 18:00 15 ЛИПНЯ 2018 РОКУ". www.facebook.com/pressjfo.news (in Ukrainian). JFO. 15 July 2018. Retrieved 15 July 2018. ^ a b "Зведення щодо обстановки в районі проведення операції Об'єднаних сил станом на 07.00 16 липня 2018" (in Ukrainian). MoD. 16 July 2018. Retrieved 16 July 2018. ^ "JFO: Ukraine reports 1 WIA amid 29 enemy attacks in Donbas in past day | According to intelligence reports, one enemy troop was killed and another one was wounded". UNIAN. 16 July 2018. Retrieved 16 July 2018. ^ "One defender wounded in 29 attacks on Ukrainian positions in Donbas". Ukrinform. 16 July 2018. Retrieved 16 July 2018. ^ "В зоне обстрела со стороны ВСУ оказались Гольмовский и Еленовка - СЦКК". vk.com. Retrieved 16 July 2018. ^ "ЛНР: оперативная сводка – обстреляны Сокольники и Калиново". News Front - Новостной Фронт. Новости Мира России Украины (in Russian). Retrieved 16 July 2018. ^ a b "Зведення щодо обстановки в районі проведення операції Об'єднаних сил станом на 07:00 17 липня 2018 року" (in Ukrainian). MoD. 17 July 2018. Retrieved 17 July 2018. ^ "Donbas update: Ukraine reports 1 WIA amid 19 enemy attacks | According to intelligence reports, two enemy troops were wounded". UNIAN. 17 July 2018. Retrieved 17 July 2018. ^ "Militants violated ceasefire in eastern Ukraine 19 times in last day". Ukrinform. 17 July 2018. Retrieved 17 July 2018. ^ "ВСУ обстреливали Донецк, Докучаевск и Петровское - СЦКК". vk.com. 17 July 2018. Retrieved 17 July 2018. ^ "ЛНР: два обстрела за сутки, разрушений нет". News Front - Новостной Фронт. Новости Мира России Украины (in Russian). Retrieved 17 July 2018. ^ "ЗВЕДЕННЯ СТАНОМ НА 18:00 17 ЛИПНЯ 2018 РОКУ". www.facebook.com/pressjfo.news (in Ukrainian). JFO. 17 July 2018. Retrieved 17 July 2018. ^ a b "Зведення щодо обстановки в районі проведення операції Об'єднаних сил станом на 07.00 18 липня 2018" (in Ukrainian). MoD. 18 July 2018. Retrieved 18 July 2018. ^ "Ukraine reports 1 KIA, 2 WIA's amid 21 enemy attacks in Donbas in past day | Three enemy troops were reportedly killed and another three were wounded in fighting with Ukraine's Joint Forces". UNIAN. 18 July 2018. Retrieved 18 July 2018. ^ "Militants violated ceasefire in eastern Ukraine 21 times in last day". Ukrinform. 18 July 2018. Retrieved 18 July 2018. ^ "Перемирие продолжается: ВСУ открыли огонь по ДНР". News Front - Новостной Фронт. Новости Мира России Украины (in Russian). Retrieved 17 July 2018. ^ 24, Донецк. "Зафиксированы очередные многочисленные обстрелы со стороны ВСУ". Донецк 24 (in Russian). Retrieved 18 July 2018. ^ 24, Донецк. "Ежедневная сводка нарушений режима прекращения огня за период с 3:00 17 июня по 3:00 18 июля - СЦКК". Донецк 24 (in Russian). Retrieved 18 July 2018. ^ 24, Донецк. "Заявление официального представителя УНМ ДНР по обстановке на 18 июля 2018 года". Донецк 24 (in Russian). Retrieved 18 July 2018. ^ 24, Донецк. "Оперативная сводка за сутки с 17 на 18 июля от НМ ЛНР". Донецк 24 (in Russian). Retrieved 18 July 2018. ^ "Операція об'єднаних сил / Joint forces operation | Зведення станом на 18:00 14 ЛИПНЯ 2018 РОКУ року" (in Ukrainian). Press-centre of the JFO HQ. 18 July 2018. Retrieved 18 July 2018. ^ a b "Зведення щодо обстановки в районі проведення операції Об'єднаних сил станом на 07:00 19 липня 2018 року" (in Ukrainian). MoD. 19 July 2018. Retrieved 19 July 2018. ^ "JFO: Ukraine reports 17 enemy attacks in last day | No casualties among the Ukrainian troops have been reported over the past day". UNIAN. 19 July 2018. Retrieved 19 July 2018. ^ "Militants violated ceasefire in eastern Ukraine 17 times in last day". Ukrinform. 19 July 2018. Retrieved 19 July 2018. ^ 24, Донецк. "Ежедневная сводка нарушений режима прекращения огня за период с 3:00 18 июня по 3:00 19 июля - СЦКК". Донецк 24 (in Russian). Retrieved 19 July 2018. ^ "За сутки ВСУ нарушили перемирие семь раз, есть повреждения - СЦКК". vk.com. Retrieved 19 July 2018. ^ "ЛНР: оперативная сводка — обстрелян поселок Лозовое". News Front - Новостной Фронт. Новости Мира России Украины (in Russian). Retrieved 19 July 2018. ^ "ЗВЕДЕННЯ СТАНОМ НА 18:00 19 ЛИПНЯ 2018 РОКУ". www.facebook.com/pressjfo.news (in Ukrainian). JFO. 19 July 2018. Retrieved 19 July 2018. ^ a b "Зведення щодо обстановки в районі проведення операції Об'єднаних сил станом на 07.00 20 липня 2018" (in Ukrainian). MoD. 20 July 2018. Retrieved 20 July 2018. ^ "Militants violated ceasefire in eastern Ukraine 18 times in last day". Ukrinform. 20 July 2018. Retrieved 20 July 2018. ^ 24, Донецк. "ВСУ вновь обстреливают Докучаевск - СЦКК". Донецк 24 (in Russian). Retrieved 20 July 2018. ^ 24, Донецк. "Зафиксирован обстрел ВСУ по направлению Талаковка - Коминтерново". Донецк 24 (in Russian). Retrieved 20 July 2018. ^ 24, Донецк. "Зафиксированы очередные многочисленные обстрелы со стороны ВСУ". Донецк 24 (in Russian). Retrieved 20 July 2018. ^ "В результате обстрела со стороны ВСУ Докучаевска зафиксированы повреждения на флюсо-доломитном комбинате — СЦКК". vk.com. Retrieved 20 July 2018. ^ 24, Донецк. "Ежедневная сводка нарушений режима прекращения огня за период с 3:00 19 июня по 3:00 20 июля - СЦКК". Донецк 24 (in Russian). Retrieved 20 July 2018. ^ "Киевские силовики за неделю 30 раз нарушили режим тишины в ДНР". News Front - Новостной Фронт. Новости Мира России Украины (in Russian). Retrieved 20 July 2018. ^ 24, Донецк. "Оперативная сводка за сутки с 19 на 20 июля от НМ ЛНР". Донецк 24 (in Russian). Retrieved 20 July 2018. ^ "Операція об'єднаних сил / Joint forces operation | Зведення станом на 18:00 20 ЛИПНЯ 2018 РОКУ року" (in Ukrainian). Press-centre of the JFO HQ. 20 July 2018. Retrieved 20 July 2018. ^ a b "Зведення щодо обстановки в районі проведення операції Об'єднаних сил станом на 07:00 21 липня 2018 року" (in Ukrainian). MoD. 21 July 2018. Retrieved 21 July 2018. ^ "Donbas update: 3 Ukrainian troops wounded in enemy shelling | Russian proxy forces opened fire on Ukraine positions 29 times over the past 24 hours". UNIAN. 21 July 2018. Retrieved 21 July 2018. ^ "Militants violated ceasefire in eastern Ukraine 29 times in last day". Ukrinform. 21 July 2018. Retrieved 21 July 2018. ^ a b "ЕЖЕДНЕВНАЯ СВОДКА НАРУШЕНИЙ РЕЖИМА ПРЕКРАЩЕНИЯ ОГНЯ ЗА ПЕРИОД С 3:00 20 ИЮЛЯ ПО 3:00 21 ИЮЛЯ от СЦКК". Социальная сеть Новороссии GOVES. Retrieved 22 July 2018. ^ "ВСУ продолжают обстреливать многострадальный Докучаевск | ПолитНавигатор". Политнавигатор - Новости Украины и России (in Russian). Retrieved 22 July 2018. ^ "ВСУ продолжает обстреливать поселки с мирными жителями в ДНР | Горячая линия ДНР". Горячая линия ДНР (in Russian). 20 July 2018. Retrieved 22 July 2018. ^ "20:55 - с направления н.п. Гнутово (Мариуполь) - н.п. Коминтерново, АГС, БМП-2, крупнокалиберное и стрелковое оружие" (in Russian). 20 July 2018. Retrieved 22 July 2018. ^ "ЛНР: оперативная сводка – обстрелян поселок Калиново". News Front - Новостной Фронт. Новости Мира России Украины (in Russian). Retrieved 22 July 2018. ^ "ЗВЕДЕННЯ СТАНОМ НА 18:00 21 ЛИПНЯ 2018 РОКУ". www.facebook.com/pressjfo.news (in Ukrainian). JFO. 21 July 2018. Retrieved 21 July 2018. ^ a b "Зведення щодо обстановки в районі проведення операції Об'єднаних сил станом на 07.00 22 липня 2018" (in Ukrainian). MoD. 22 July 2018. Retrieved 22 July 2018. ^ "Ukraine's army reports 15 enemy attacks in Donbas in past day | No casualties have been reported". UNIAN. 22 July 2018. Retrieved 22 July 2018. ^ "ВСУ продолжают обстреливать Коминтерново и Саханку из минометов - СЦКК". vk.com. 21 July 2018. Retrieved 22 July 2018. ^ "Зафиксирован обстрел со стороны ВСУ по Саханке - СЦКК". vk.com. 21 July 2018. Retrieved 22 July 2018. ^ "Зафиксирован обстрел со стороны ВСУ по Коминтерново - СЦКК". vk.com. 21 July 2018. Retrieved 22 July 2018. ^ a b "В зоне обстрела со стороны ВСУ оказались Коминтерново, Ленинское, Саханка и Ясиноватая - СЦКК". vk.com. 22 July 2018. Retrieved 22 July 2018. ^ "ЛНР: оперативная сводка – обстрелян поселок Лозовое". News Front - Новостной Фронт. Новости Мира России Украины (in Russian). Retrieved 22 July 2018. ^ "Операція об'єднаних сил / Joint forces operation | Зведення станом на 18:00 22 ЛИПНЯ 2018 РОКУ року" (in Ukrainian). Press-centre of the JFO HQ. 22 July 2018. Retrieved 22 July 2018. ^ a b "Зведення щодо обстановки в районі проведення операції Об'єднаних сил станом на 07:00 23 липня 2018 року" (in Ukrainian). MoD. 23 July 2018. Retrieved 23 July 2018. ^ "Donbas update: Ukraine reports 1 WIA amid 15 enemy attacks | Two enemy troops were reportedly wounded in clashes with Ukraine's Joint Forces". UNIAN. 23 July 2018. Retrieved 23 July 2018. ^ "Militants launched 15 attacks on Ukrainian troops in Donbas in last day". Ukrinform. 23 July 2018. Retrieved 23 July 2018. ^ "ВСУ обстреливают населенные пункты Республики - СЦКК". vk.com. 22 July 2018. Retrieved 22 July 2018. ^ "ВСУ обстреляли Коминтерново и Саханку - СЦКК". vk.com. 22 July 2018. Retrieved 22 July 2018. ^ 24, Донецк. "Ежедневная сводка нарушений режима прекращения огня за период с 3:00 22 июня по 3:00 23 июля - СЦКК". Донецк 24 (in Russian). Retrieved 23 July 2018. ^ 24, Донецк. "Заявление начальника пресс-службы управления НМ ЛНР от 23 июля 2018 года". Донецк 24 (in Russian). Retrieved 23 July 2018. ^ "Зведення станом на 18:00 23 липня 2018 року". www.facebook.com/pressjfo.news (in Ukrainian). JFO. 23 July 2018. Retrieved 23 July 2018. ^ a b "Зведення щодо обстановки в районі проведення операції Об'єднаних сил станом на 07.00 24 липня 2018" (in Ukrainian). MoD. 24 July 2018. Retrieved 24 July 2018. ^ "JFO: Ukraine reports 2 WIAs amid 21 enemy attacks in Donbas in past day | According to intelligence reports, four occupiers were wounded". UNIAN. 24 July 2018. Retrieved 24 July 2018. ^ "According to intelligence reports, four occupiers were wounded". Ukrinform. 24 July 2018. Retrieved 24 July 2018. ^ 24, Донецк. "Ежедневная сводка нарушений режима прекращения огня за период с 3:00 23 июня по 3:00 24 июля - СЦКК". Донецк 24 (in Russian). Retrieved 24 July 2018. ^ "ЛНР: оперативная информация — обстрелян Желобок, жертв нет". News Front - Новостной Фронт. Новости Мира России Украины (in Russian). Retrieved 24 July 2018. ^ "Операція об'єднаних сил / Joint forces operation | Зведення станом на 18:00 24 липня 2018 року" (in Ukrainian). Press-centre of the JFO HQ. 24 July 2018. Retrieved 24 July 2018. ^ a b "Зведення щодо обстановки в районі проведення операції Об'єднаних сил станом на 07:00 25 липня 2018 року" (in Ukrainian). MoD. 25 July 2018. Retrieved 25 July 2018. ^ "JFO: Ukraine reports 33 enemy attacks in last day | No casualties among the Ukrainian troops have been reported over the past day". UNIAN. 25 July 2018. Retrieved 25 July 2018. ^ "No casualties among Ukrainian troops reported in last day". Ukrinform. 25 July 2018. Retrieved 25 July 2018. ^ 24, Донецк. "Ежедневная сводка нарушений режима прекращения огня за период с 3:00 24 июня по 3:00 25 июля - СЦКК". Донецк 24 (in Russian). Retrieved 25 July 2018. ^ 24, Донецк. "Оперативная сводка за сутки с 24 на 25 июля от НМ ЛНР". Донецк 24 (in Russian). Retrieved 25 July 2018. ^ "Зведення станом на 18:00 25 липня 2018 року". www.facebook.com/pressjfo.news (in Ukrainian). JFO. 25 July 2018. Retrieved 25 July 2018. ^ "Ранкове зведення на 07:00 26 липня 2018 року". www.facebook.com/pressjfo.news (in Ukrainian). JFO. 25 July 2018. Retrieved 25 July 2018. ^ a b "Зведення щодо обстановки в районі проведення операції Об'єднаних сил станом на 07.00 24 липня 2018" (in Ukrainian). MoD. 26 July 2018. Retrieved 26 July 2018. ^ "JFO: Ukraine reports 2 WIAs amid 24 enemy attacks in Donbas in past day | According to intelligence reports, one occupier was killed and three others were wounded". UNIAN. 26 July 2018. Retrieved 26 July 2018. ^ "Militants launched 24 attacks on Ukrainian troops in Donbas in last day". Ukrinform. 26 July 2018. Retrieved 26 July 2018. ^ a b 24, Донецк. "Ежедневная сводка нарушений режима прекращения огня за период с 3:00 25 июня по 3:00 26 июля - СЦКК". Донецк 24 (in Russian). Retrieved 26 July 2018. ^ 24, Донецк. "Оперативная сводка за сутки с 25 на 26 июля от НМ ЛНР". Донецк 24 (in Russian). Retrieved 26 July 2018. ^ "Операція об'єднаних сил / Joint forces operation | Зведення станом на 18:00 24 липня 2018 року" (in Ukrainian). Press-centre of the JFO HQ. 26 July 2018. Retrieved 26 July 2018. ^ a b "Зведення щодо обстановки в районі проведення операції Об'єднаних сил станом на 07:00 27 липня 2018 року" (in Ukrainian). MoD. 27 July 2018. Retrieved 27 July 2018. ^ "Ukraine reports 1 KIA, 1 WIA amid 32 enemy attacks in Donbas in past day | Two enemy troops were reportedly killed and another two were wounded in fighting with Ukraine's Joint Forces". UNIAN. 27 July 2018. Retrieved 27 July 2018. ^ "Militants launched 32 attacks on Ukrainian troops in Donbas in last day". Ukrinform. 27 July 2018. Retrieved 27 July 2018. ^ "Зафиксирован обстрел со стороны ВСУ по Ясиноватой | Официальный сайт ДНР". Официальный сайт ДНР (in Russian). 26 July 2018. Retrieved 29 July 2018. ^ "Зафиксирован обстрел со стороны ВСУ по Коминтерново | Официальный сайт ДНР". Официальный сайт ДНР (in Russian). 26 July 2018. Retrieved 29 July 2018. ^ "В результате обстрелов ВСУ повреждены жилые дома - СЦКК | Официальный сайт ДНР". Официальный сайт ДНР (in Russian). 27 July 2018. Retrieved 27 July 2018. ^ "ВСУ порядка сорока раз обстреляли территорию ДНР за прошедшую неделю". News Front - Новостной Фронт. Новости Мира России Украины (in Russian). Retrieved 28 July 2018. ^ 24, Донецк. "Оперативная сводка за сутки с 26 на 27 июля от НМ ЛНР". Донецк 24 (in Russian). Retrieved 27 July 2018. ^ "Операція об'єднаних сил / Joint forces operation | Зведення станом на 18:00 27 липня 2018 року" (in Ukrainian). Press-centre of the JFO HQ. 27 July 2018. Retrieved 27 July 2018. ^ a b "Ранкове зведення на 07:00 28 липня 2018 року" [Morning briefing at 07:00 28 July 2018] (in Ukrainian). MoD. 28 July 2018. Retrieved 28 July 2018. ^ "Ukraine reports 1 KIA amid 34 enemy attacks in Donbas in past day | Two enemy troops were reportedly killed and another five were wounded in fighting with Ukraine's Joint Forces". UNIAN. 28 July 2018. Retrieved 28 July 2018. ^ "Militants launched 34 attacks on Ukrainian troops in Donbas in last day". Ukrinform. 28 July 2018. Retrieved 28 July 2018. ^ "ВСУ обстреляли Саханку - СЦКК | Официальный сайт ДНР". Официальный сайт ДНР (in Russian). 27 July 2018. Retrieved 29 July 2018. ^ "ВСУ обстреляли Саханку и Ленинское - СЦКК | Официальный сайт ДНР". Официальный сайт ДНР (in Russian). 27 July 2018. Retrieved 29 July 2018. ^ "ВСУ применили по территории Республики более 50 боеприпасов | Официальный сайт ДНР". Официальный сайт ДНР (in Russian). 28 July 2018. Retrieved 29 July 2018. ^ "ЛНР: оперативная сводка — обстреляны Желобок и Сокольники". News Front - Новостной Фронт. Новости Мира России Украины (in Russian). Retrieved 29 July 2018. ^ "Операція об'єднаних сил / Joint forces operation | Зведення станом на 18:00 24 липня 2018 року" (in Ukrainian). Press-centre of the JFO HQ. 28 July 2018. Retrieved 28 July 2018. ^ "Боевики пытались захватить позиции возле Крымского, ОС отрезали путь назад" (in Russian). Censor.NET. 29 July 2018. Retrieved 29 July 2018. ^ a b "Зведення щодо обстановки в районі проведення операції Об'єднаних сил станом на 07:00 29 липня 2018 року" (in Ukrainian). MoD. 29 July 2018. Retrieved 29 July 2018. ^ "Ukraine reports 2 KIA's, 2 WIA's amid 25 enemy attacks in past day | Four enemy troops were reportedly killed and another six were wounded in fighting with Ukraine's Joint Forces". UNIAN. 29 July 2018. Retrieved 29 July 2018. ^ "ВСУ обстреляли Докучаевск и Спартак | Официальный сайт ДНР". Официальный сайт ДНР (in Russian). 28 July 2018. Retrieved 29 July 2018. ^ "В зоне обстрела со стороны ВСУ оказались Докучаевск и Спартак | Официальный сайт ДНР". Официальный сайт ДНР (in Russian). 29 July 2018. Retrieved 29 July 2018. ^ "Оперативная сводка за сутки с 28 на 29 июля от НМ ЛНР". Социальная сеть Новороссии GOVES. Retrieved 29 July 2018. ^ "Операція об'єднаних сил / Joint forces operation | Зведення станом на 18:00 29 липня 2018 року" (in Ukrainian). Press-centre of the JFO HQ. 29 July 2018. Retrieved 29 July 2018. ^ a b "Зведення щодо обстановки в районі прведення операції Об'єднаних сил станом на 07:00 30 липня 2018 року" (in Ukrainian). MoD. 30 July 2018. Retrieved 30 July 2018. ^ "Ukraine reports 1 WIA amid 30 enemy attacks in Donbas in past day | Two enemy troops were reportedly wounded in fighting with Ukraine's Joint Forces". UNIAN. 30 July 2018. Retrieved 30 July 2018. ^ "Militants launched 30 attacks on Ukrainian troops in Donbas in last day". Ukrinform. 30 July 2018. Retrieved 30 July 2018. ^ 24, Донецк. "Ежедневная сводка нарушений режима прекращения огня за период с 3:00 29 июля по 3:00 30 июля - СЦКК". Донецк 24 (in Russian). Retrieved 30 July 2018. ^ "Оперативная сводка по ЛНР: обстреляны два поселка, потерь нет". News Front - Новостной Фронт. Новости Мира России Украины (in Russian). Retrieved 30 July 2018. ^ "Операція об'єднаних сил / Joint forces operation | Зведення станом на 18:00 30 липня 2018 року" (in Ukrainian). Press-centre of the JFO HQ. 30 July 2018. Retrieved 30 July 2018. ^ a b "Зведення щодо обстановки в районі проведення операції Об'єднаних сил станом на 07:00 31 липня 2018 року" (in Ukrainian). MoD. 31 July 2018. Retrieved 31 July 2018. ^ "JFO: Ukraine reports 3 WIA's amid 40 enemy attacks in Donbas in past day | According to intelligence reports, one enemy troop was killed and four others were wounded". UNIAN. 31 July 2018. Retrieved 31 July 2018. ^ "Militants launched 40 attacks on Ukrainian troops in Donbas in last day". Ukrinform. 31 July 2018. Retrieved 31 July 2018. ^ 24, Донецк. "Зафиксированы обстрелы со стороны ВСУ по трем направлениям - СЦКК". Донецк 24 (in Russian). Retrieved 30 July 2018. ^ 24, Донецк. "Зафиксирован обстрел со стороны ВСУ по направлению Славное - Еленовка". Донецк 24 (in Russian). Retrieved 30 July 2018. ^ 24, Донецк. "Южные села ДНР подверглись массированному удару со стороны украинских военных – СЦКК". Донецк 24 (in Russian). Retrieved 30 July 2018. ^ "ВСУ из гранатометов обстреляли Октябрь - СЦКК | Официальный сайт ДНР". Официальный сайт ДНР (in Russian). 30 July 2018. Retrieved 30 July 2018. ^ 24, Донецк. "Ежедневная сводка нарушений режима прекращения огня за период с 3:00 30 июля по 3:00 31 июля - СЦКК". Донецк 24 (in Russian). Retrieved 31 July 2018. ^ "Оперативная сводка ЛНР: обстреляны три населенных пункта". News Front - Новостной Фронт. Новости Мира России Украины (in Russian). Retrieved 1 August 2018. ^ "При обстреле погиб военнослужащий НМ ЛНР | Официальный сайт ДНР". Официальный сайт ДНР (in Russian). 31 July 2018. Retrieved 1 August 2018. ^ "Операція об'єднаних сил / Joint forces operation | Зведення станом на 18:00 31 липня 2018 року" (in Ukrainian). Press-centre of the JFO HQ. 31 July 2018. Retrieved 31 July 2018. ^ "Militants violated ceasefire in eastern Ukraine 36 times in last day". Ukrinform. 1 August 2018. Retrieved 1 August 2018.